All of you let us know loud and clear after the June release of Friendship Jar that you couldn't wait to see more. What you didn't know is that Michelle & I were both already scheming some exciting coordinating images perfect for the upcoming holidays! 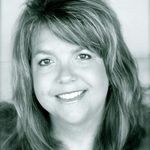 Anyone who is a dedicated blog reader of Michelle Wooderson knows how much she loves fall & Halloween. She was able to use this passion to create amazing sketches as to what her vision was for a Fall Fillers addition to the original Friendship Jar stamp set. This set is chock FULL of amazing ways to fill the original Friendship Jar for both fall and Halloween. From beautiful autumn foliage & decor to whimsical Halloween images, you will not be disappointed with the amazing creations that await you with this set! Friendship Jar Fall Fillers will be available for sale on August 15th. Friendship Jar Fall Fillers contains a total of 28 stamps (4 full-size jar filler images, 8 companion jar filler images, 1 label border and 15 sentiments). This set coordinates with the original Friendship Jar stamp set. I also get to introduce you to our patterned paper collection for this month, Halloween Prints designed by Heather Nichols. It contains a wonderful mix of patterns hinged on the classic Halloween color scheme of True Black, Orange Zest and just a tad of Ripe Avocado thrown in for good measure. Halloween Prints paper collection will be available for sale on August 15th. 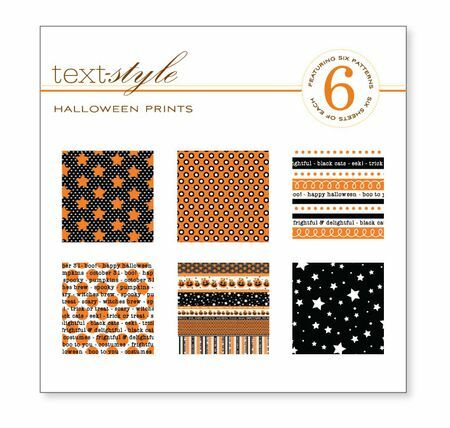 Halloween Prints paper collection 36 (8×8) sheets, 6 sheets each of 6 patterns. It coordinates with True Black, Orange Zest and Ripe Avocado and is printed on white paper. 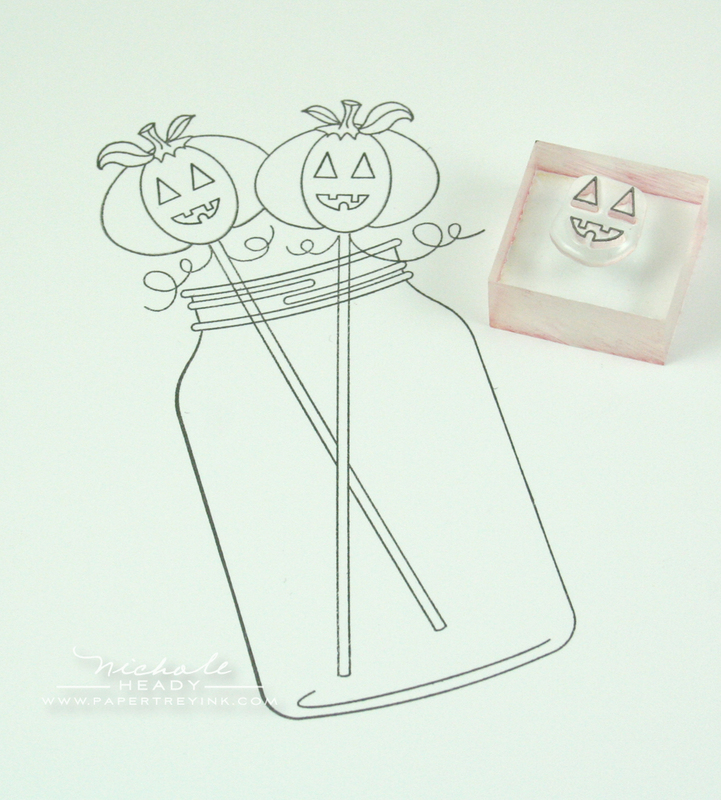 The pumpkin images in this set coordinate with Boo to You stamp set. With these amazing elements to work with, I was able to create some fantastic festive projects that I am looking forward to sharing with you today! For my first project I thought I would design an autumnal card. There's nothing like the rich, vibrant colors of fall foliage once the seasons change. I started by die-cutting the Jar & Lid die from Vintage cream cardstock. 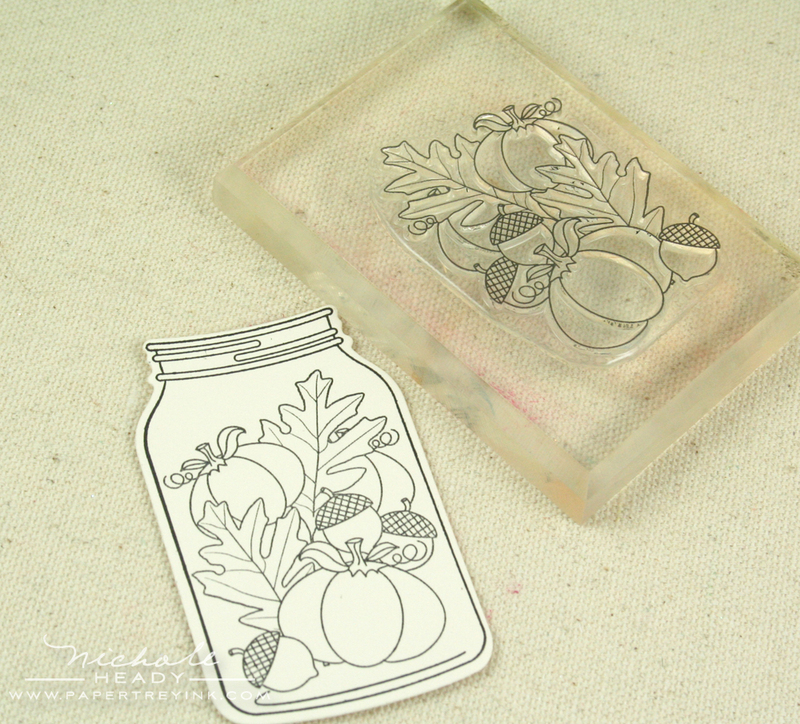 I then stamped the jar image from Friendship Jar, followed by the foliage filler image from the new set. I used Copic markers to color in the details. Orange Zest & Ripe Avocado for the pumpkins. Terracotta Tile for the leaves. Dark Chocolate for the acorns. And a little T1 for shading. I die cut the lid from Kraft cardstock, stamped the coordinating image from Friendship Jar and colored it with Dark Chocolate Copic Trio. I then die-cut the Jar Toppers die from Vintage Cream cardstock. I pulled aside this ruffled topper and stamped it with it's stamp counterpart from Friendship Jar as well in Ripe Avocado ink. I die-cut the Jar Label die from Vellum cardstock. Stamped the new dotted label frame from Friendship Jar Fall Fillers in Black Noir Palette ink. Followed by the sentiment from the same set. The Kraft card base is stamped with one of the large flourishes from Embellishments using Versamark ink. Isn'e the final assembled jar image just amazing? I love how all of the pieces come together to form something so cohesive. I wrapped Rustic Jute Button Twine around the card base a few times and tied it off with a knot as a way to create a subtle border to help balance out the project. 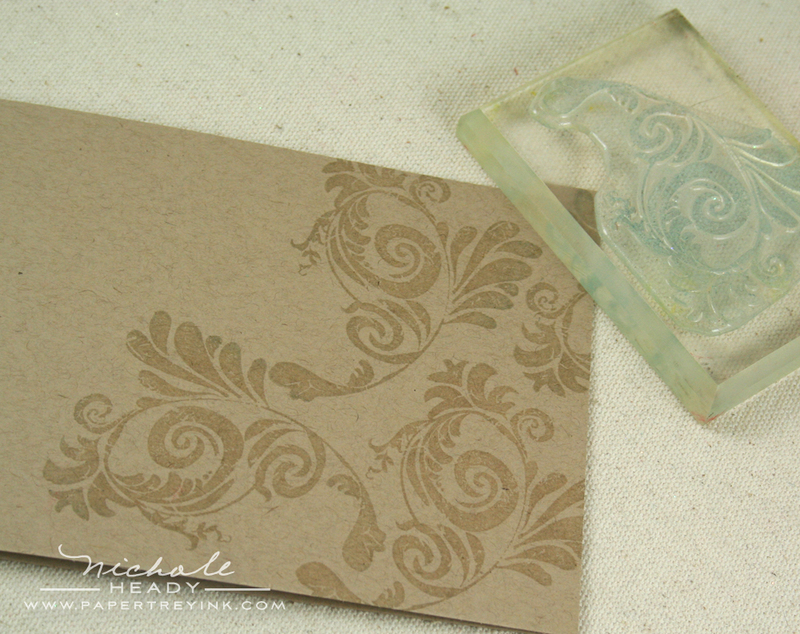 As one last step, I swiped the edges of the card front with Vintage Cream ink. How's this for a fun take on a Halloween card? 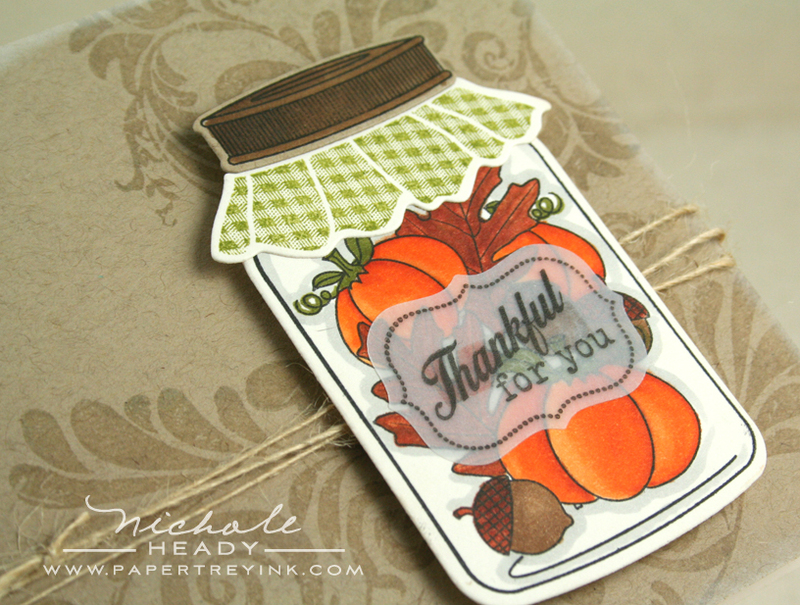 I die-cut the Jar from Vintage Cream cardstock and stamped it with the coordinating jar image from Friendship Jar. 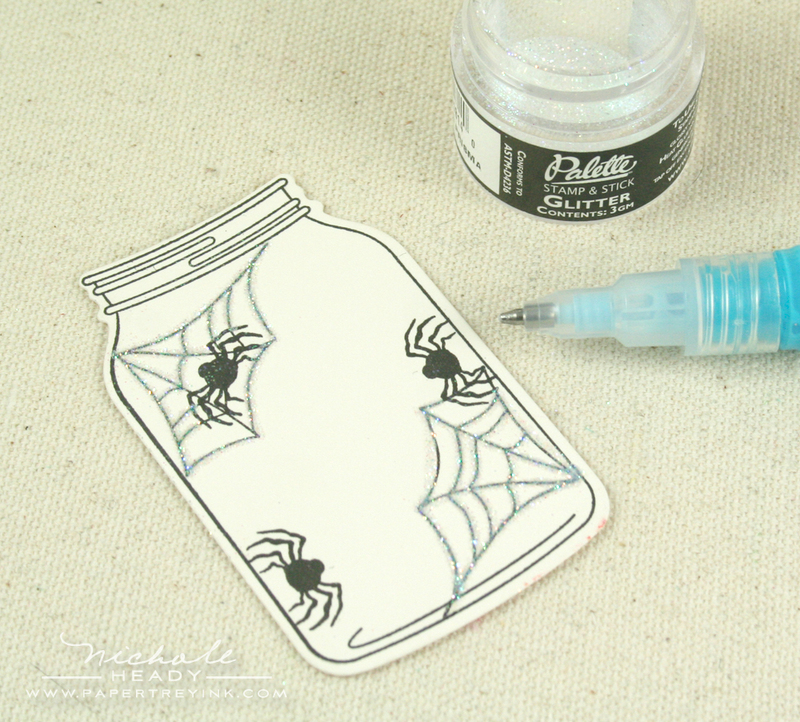 I then added the web & spider images from Friendship Jar Fall Fillers using black ink. I carefully traced over the spider web images with my 2-way glue pen and sprinkled on some prisma glitter. 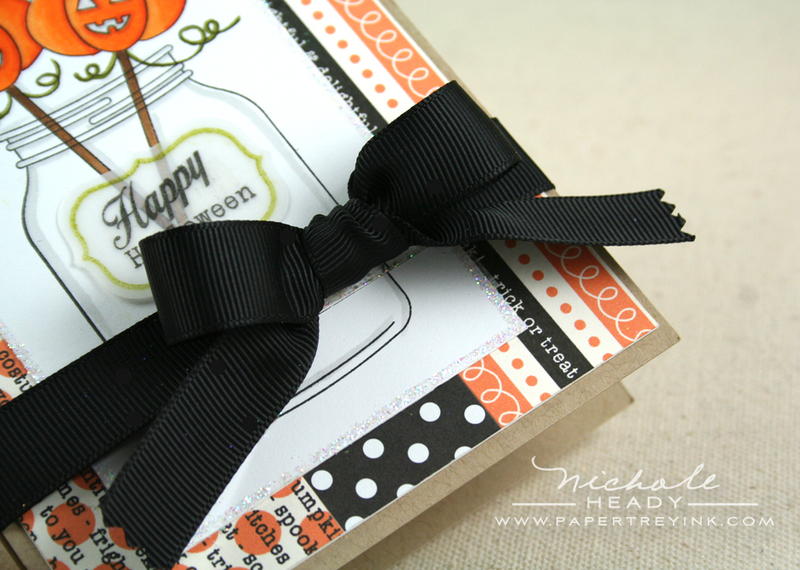 The label was die-cut from Summer Sunrise cardstock, the label frame stamped in Orange Zest and the sentiment in black. After adhering the jar in place, I added the lid at a slight angle in the background. I also added several spiders on the outside of the jar to make it appear as though they are escaping from it. This sentiment stamped on a strip of Summer Sunrise cardstock is from 2009 Halloween Tags. 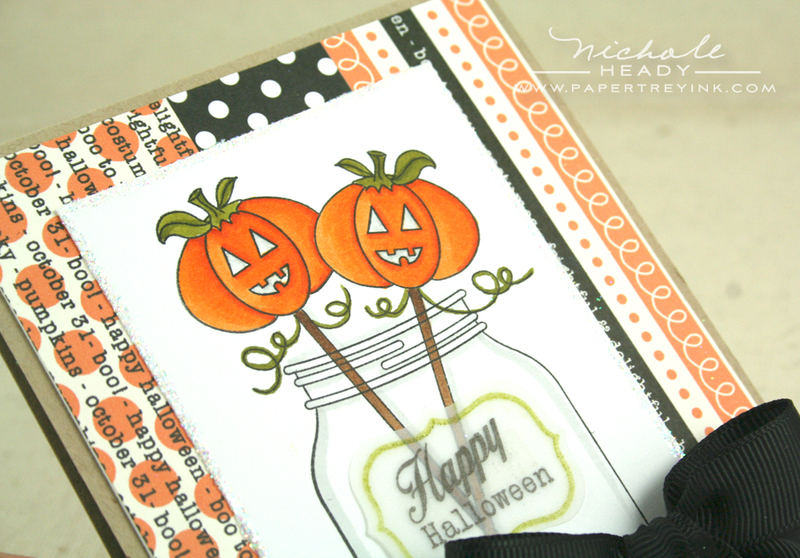 the patterned paper is one of the festive creation included in the new Halloween Prints paper pad. My boys thought this card was "so awesome" and I am sure you can think of plenty of recipients in your own life that would think the same! Here's another Halloween card that could easily be recreated as a Fall card. Let me show you how! It started with the jar image from Friendship Jar and the sticks image from Friendship Jar Fall Fillers. There are several different options from this new set to add to the tops of these sticks… ghosts, candy apples, and pumpkins like I selected here. Now, I could leave these pumpkins like this to recreate the card I showed a few moments ago as a Fall card, but I wanted to show you how easy it is to change these pumpkins into miniature jack-o-lanterns. This little face image fits perfectly within the center portion of the pumpkins, giving them a Halloween flair. I colored the pumpkins with Orange Zest & Ripe Avocado Copic Trios, with a bit of T1 for shading. The image was edged with a 2-way glue pen and dipped in prisma glitter. I layered the focal point on top of various prints from both the new Halloween Prints collection and the Black & White Basics: pad. I finished the card with a bow tied with True Black Grosgrain ribbon. It certainly turns out to be quite a festive project! 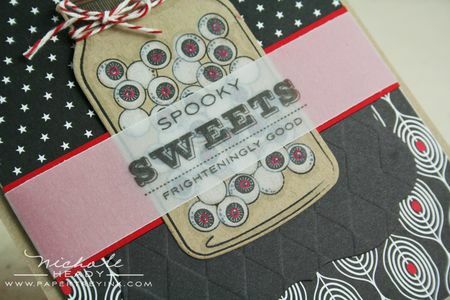 These spooky little treats are actually created with something from the original Friendship Jar Filler stamp set. Can you guess what it is? I started by stamping the marbles from the original set within the jar using Black Noir ink. To capture the whites of the eyeballs, I used a q-tip to apply Fresh Snow ink to each one. 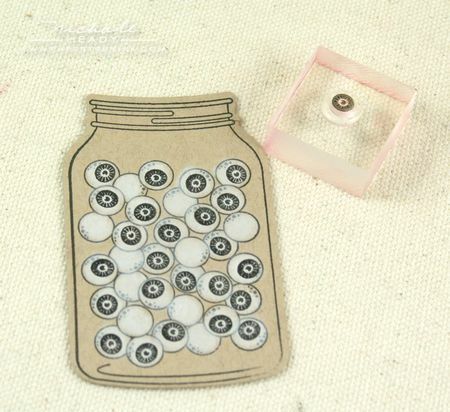 I then used this special stamp from the new Friendship Jar Fall Fillers set to turn all of the marbles officially into eyeballs. I went back in with a Pure Poppy Copic to add red to each of the eyes. A strip of vellum cardstock was placed across the final jar, featuring a sentiment from Spooky Sweets. I used half of a Mat Stack underneath the bottom half of the jar. It was die-cut from Smokey Shadow cardstock and impressed with the Argyle impression plate. Also note the portions of the bottom patterned paper that I added red centers to using a Pure Poppy Copic marker. I tied a bit of Pure Poppy Baker's Twine around the top of the jar as an added detail. This last project uses one of my favorite images from the set. 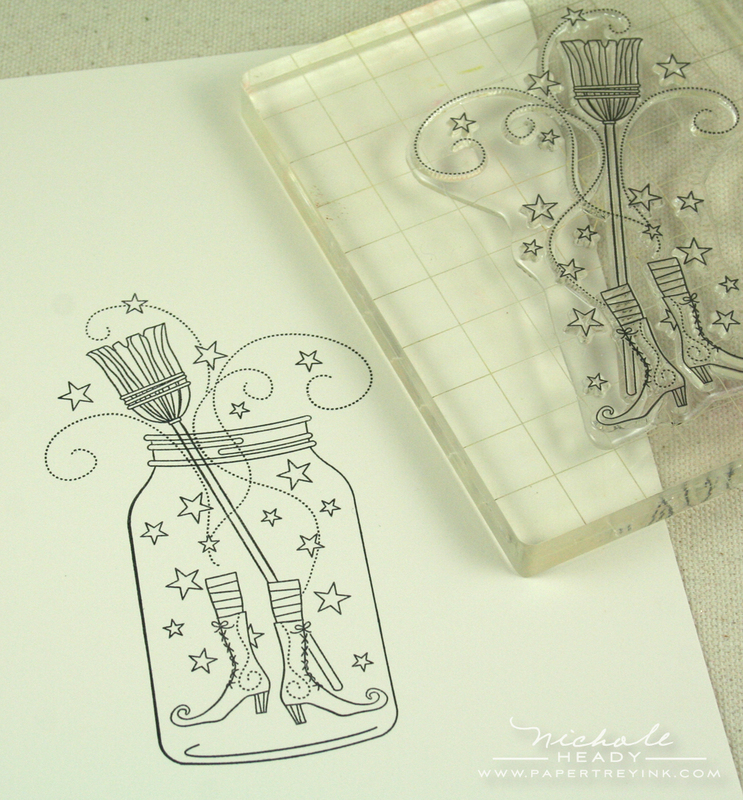 I stamped this witch ensemble inside the jar using Black Noir ink onto Vintage Cream Cardstock. Don't you just love all the swirls and stars? After coloring the image in, I accented the swirls with a 2-way glue pen and prisma glitter. 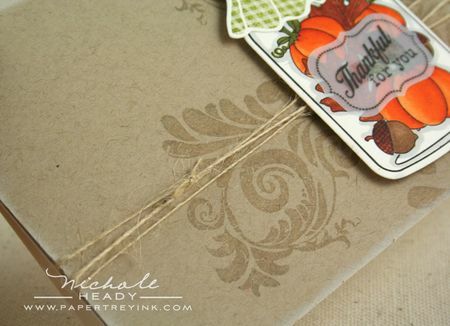 A strip of vellum cardstock serves as the perfect place to add a sentiment from 2009 Halloween Tags, with a bit of random stitching on each end to help keep it in place. I hope you enjoyed all of today's projects! I certainly had fun putting these festive creations together for you! What do you think of the Friendship Jar series? Do you already have the original Friendship Jar set? If not, do you think you might be adding it to your wish list now? You can have a chance to win amazing prize package just by letting us know your thoughts! This fantastic package gives you everything you need to begin creating jar projects galore and has nearly a $90 value, so you won't want to miss out! This contest will close at 7am EST, Saturday, August 14th. Only one comment per person please. One randomly selected winner will be announced no later than noon EST on our August Release Winners page. Thanks for stopping by today and good luck! Be sure to stop by and visit Michelle Wooderson today to see what she created using Friendship Jar Fall Fillers. Alli Miles is featuring more inspiration using Gobble, Gobble & Take Three: Fall. 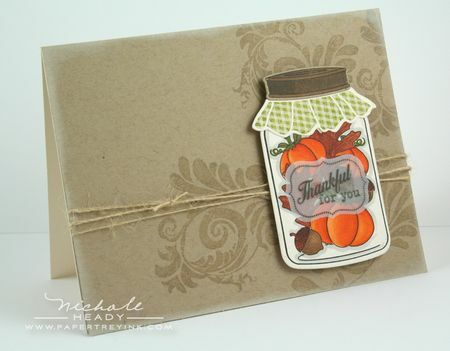 Heather Nichols is showcasing both of her new sets, Falling Leaves & Fillable Frames #7. Beth Silaika has more to share with Been Boo'd. Tiffany Pastor has put together an additional project using Embellishments as well as featuring a special prize giveaway. Dawn McVey is featuring even more today using the latest Color Couture additions. Love this set….and the samples are amazing Nichole!!! Your cards are fabulous. You truly bring this set to life it looks like so much fun! OMG.What a wonderful set!! !I wish we celebrated Halloween in Greece.Many people here don t even know what it is!!! I have to admit, I have been going back and worth with this set. I liked it but was not sure how much I would use it. It is now a must, I am loving this realize. Gumballs are turned in to eyeballs and part of a whimsical witch in a jar. We are lucky, very lucky. I have yet to purchase this set 🙁 but that could be changing. Oh my goodness! It’s even better than I had hoped!! I can not wait to have this set!! Your cards are simply amazing today Nichole! Oh my goodness!! I don’t even know where to start! I love every single thing in todays post…..The projects themselves are amazing as well as that gorgeous paper and the stamps and dies make me swoon. Love it all!! I just bought the jar set and this new Fall Filler set is a definite by for release night. Another holiday set with just great designs. Love the samples Nicole. Such creativity. i am falling in love with these friendship jar sets! how clever to turn the marbels into eyeballs!! and the image of the witch with the swirls and stars is just breath taking! the dynamic duo of nichole and michelle!! fantastic job ladies! *gasp* How cute is that! I love that! WOW how are you going to keep this little treat in stock. Amazing how you brought the original sketches to life and then into todays samples of all the wonderful things you can do with this set!!! Fantastic!!! I thought I was done buying Halloween oriented stamps…BUT I am reassessing my decision!! : ) The Jar Filler Additions are just TOO cute!! Loved all your ideas as well. Love the new patterned paper! 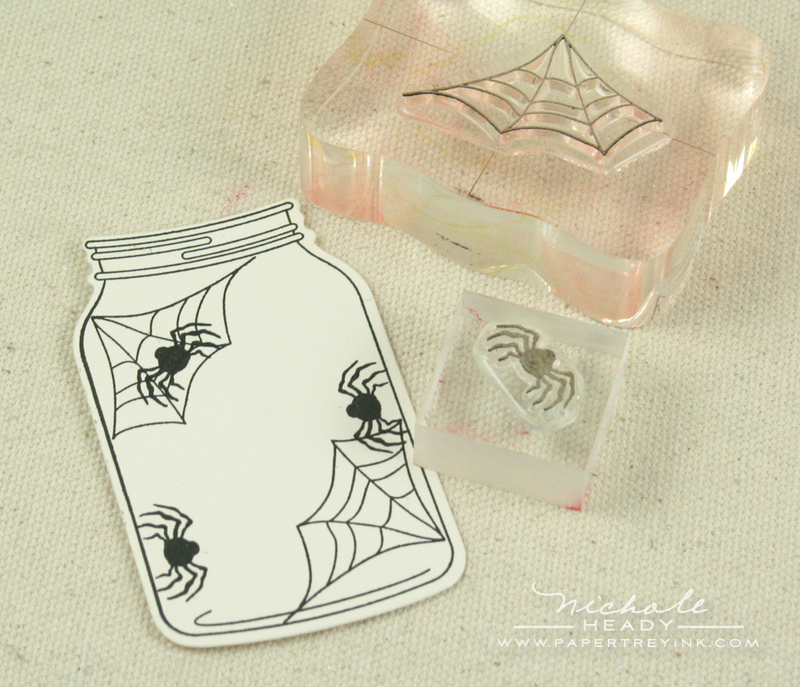 I love my Friendship Jars and the beautiful Autumn stamp in this set – but those spiders are just too spooky! My little nieces would be freaked out by them ;o) – so I’d better stick to the toffee apples and jack-o-lanterns! 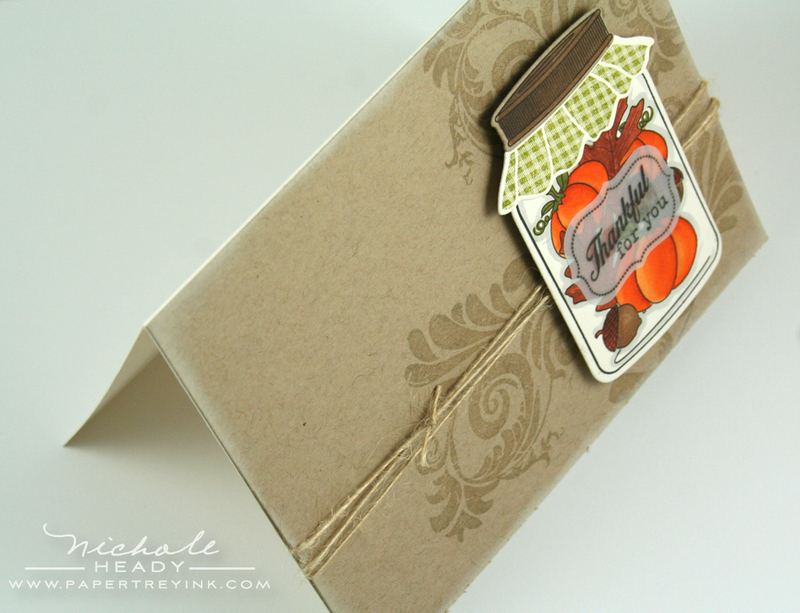 And I just love that beautiful autumn card Nichole! Can’t wait for the Christmas fillers! Love the eyeballs!! 🙂 Love the whole friendship jar idea — keep them coming! I have held off on the friendship jar but I think this release seals the deal! All the examples are just adorable. Absolutely fabulous! Love the eyeballs … )can’t wait to see hoped for fillers for winter holidays!) Card designs are all so crisp! Oh my! – – those eye balls and those spiders give me the heebs – ROTFL This is a great great Halloween set. Love what you did with the vellum labels on the jars too. 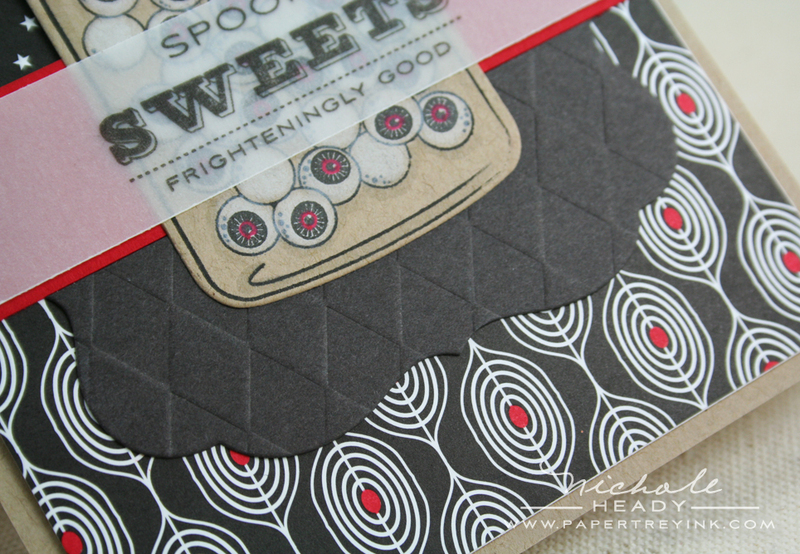 The patterned paper is so fun – – and love seeing Halloween with Plum Pudding! oh goodness me I am over the edge. Amazing just amazing. Love it all! These cards are really cute! I can’t believe that you thought to include an eyeball centre for the gumballs! I think my favourite one is the shoes and broom. Thanks for increasing the versatility of the Friendship Jar! WOW!!! Jars and halloween. What creativity. What a wonderfully spooky addition to the Friendshop Jar! I can’t wait to get this set of stamps. WoW! What an amazing transformation of the Friendship Jar for Fall and Halloween! I love everything you have put together here…I have tried to resist the jar sets, but I am beginning to see that resistance is futile! Great samples! I just “knew” I needed to get the Jar set. This has just pushed me over the edge. Fabulous! Perfect little details. How fun are these projects? Your creativity never ceases to amaze me, and I actually got the heebie jeebies looking at the jar with the spiders coming out of it. This set is simply amazing! Fabulous designs–both the stamps and the cards. These are some of the greatest Halloween cards I’ve ever seen! It just keeps getting better and better. I absolutely love the witch’s feet! So creative-these samples are amazing! What a great way to showcase this set. Love this set! Can’t wait! I was in love with the the Mason jars as soon as I set eyes on them. But I couldn’t think of any use for them. Now, with all of these adorable fillers, I’m already planning a party AROUND the jar and fillers and thinking about how to incorporate all of the fillers into treats and decorations. How crazy is that?! Seriously now.. I didn’t think I had a reason for the jar set…. Boy was I wrong… This is without a doubt a number one on my shopping list. Love it! Love the fillers for the jars. The ideas are amaing. My favorite has to be the shoes and broom! I can’t wait to see the Christmas fillers. Such a wonderful addition to the Friendship jars!! The images are just fantastic. Great job, Michelle! Nichole your projects are such fun and creative. I love the witches feet and broom. I just love that pumpkin stack. This is the best Halloween/Fall set I’ve ever seen! A definite MUST HAVE!!! Don’t stop now…..you and Mish are an UNBEATABLE combination!!! Love it (especially the eyeballs)!! Very inspiring projects! I like these ideas! It’s hard to resist purchasing this set when you show beautiful things like yours!! My resolve is weakening!!! The jars are just so cute! I love the insides of just for fall and Halloween! How much fun will they be?? But I guess you already know! 🙂 Thanks for the chance to win!!!!! I love the witches shoes/broom image and the fallish acorn/pumpkin/leaves image. Wow, what great cards! I don’t have the friendship jar stamp sets, so I guess I need to add those to my ever growing list of Papertrey items I ‘must’ have. Nichole, as my nearly 5 year old daughter would say, You Rock! I am speechless at your creativity, firstly for designing this set, then ensuring it co-ordinates with other sets already available, and now, these beauties that you have created! Wow! My wish list has grown enormously! AWESOME!! This is the best yet, love everyone one of the cards you did and all of the images!! Can’t wait for the 15th!! Another great set – love these cards! Wow, how cute is that ? Fantastic great new stamp set and dies . WOW! I’ve been holding off on getting these sets – but this is too much! Absolutely amazing! Love this set! Now I know I have to get the Freindship Jar set and this one. Thank you for all the inspiration! Your cards are amazing! Awesome! The Halloween suckers are adorable! Costumes for jars–love it! Wow! This set looks so fun! I’ve been holding off on the original Friendhip Jar set, but now it’s definitely going on my list. You’re cards are AMAZING! I don’t have the original friendship jar set — just too many good things, and not enough money, lol. I love what you’ve done here — the eyeball image? BRILLIANT 🙂 Love the samples — they’re all terrific!! This may be the set that gets me on the Friendship Jar wagon! 🙂 Every image is adorable!! LOVE it! i love all of the sample projects for friendship jar! this set is so versatile!! What a cute idea! Love it!!! Wonderful projects too! So incredibly creative! What a wonderful add-on to the original set! 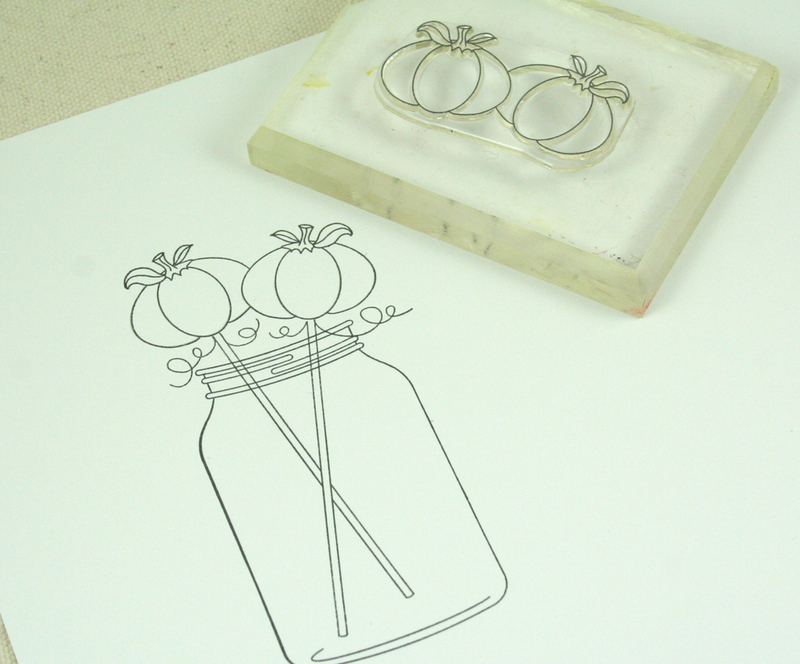 The stamps and samples are so cute – I’m starting to think of ways to use these jars in my own home decor! Love this addition to an already fabulous set! The whole friendship jar idea is so cool! I love giving ‘Gifts in a jar” and this whole design is just chock full of great possibilities. Love the eyeball candy and the pumpkin lollipops! Of course, I pretty much like it all…. Thanks for sharing your talents. Oh my is this set amazing! Your cards today were so creative! You and Mish hit a homerun again! Not a big Halloween person but these stamps are wonderful! Can’t wait to add these to my cart! Not a “Halloween lover” typically, I thought I could easily resist. BUT…this is awesome, and the projects are so well-done. I love the cards, & the many ways of using Friendship Jars. Thanks, Nichole! I love the witches feet! Must have one …. I’m in big trouble. I love all things Halloween. The shoes are my favorite. Gotta have them for my sister, the Wizard of Oz fanatic!!! Thanks, Nichole, for all the great samples. I do not have Friendship Jar, but I LOVE it! This Halloween take on it is VERY cute! This one is on the top of my wish list! I love my jars and cannot wait to get more fillers! Your samples are wonderful! Thanks for sharing your talents with us! I don’t have the original Friendship Jar set, but, I’m thinking I might need to change that! The projects using this with the Halloween additions were *too* cute! Oh my goodness this is the funnest (not sure if that is a word) set I ever saw. I got to have it. i just love the eyeball card. I can’t wait to turn my gumballs into eyeballs! I love love love this set!! 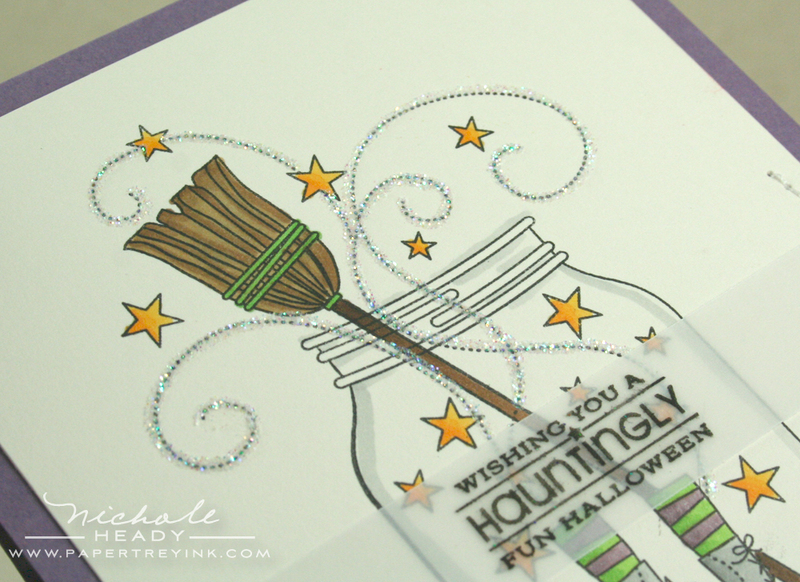 These stamps really add a fun and creative twist to Halloween papercrafting! Thanks for sharing your great designs! You have outdone yourself with this set!!! Your cards are spectacular and so very creative. So much fun! Love the witch accessories in a jar! And the spooky eyeballs!! This is a great concept and I can’t wait to see what you’ll come up with for other seasons and holidays! I love how you made the jar set more versatile!! Love all the cards you made! Great set!! Can I go ahead and put this set in my cart??? I love when you expand on existing sets, such a wonderful addition too! Does this mean there might be fillers for the Christmas season!?!? Ooh Ooh, pick me! I can’t tell you how much I would love to win this. As always, this set is amazing and your creations are just over the top Nichole. PTI is definitely in league all it’s own, and the designs and creations here really show just why that is. Oh my gosh! This is just amazing! I’ve been drooling over the original jar sets since they came out(unfortunately haven’t been able to afford buying them yet). It is just such a great concept. And there are so many possibilities with these sets. I don’t have the friendship jar sets…but that could be changing soon! I’m always amazed with the new stamps you come up with!! oh my goodness!! you girls really put a lot of thought into this set. I still have goosebumps after seeing those spiders crawling out of the jar.. so real and lifelike.. I am more of a fall –not Halloween lover, but these images are just too darn cute! I haven’t yet purchased the original ball jar set but with the addition of the Friendship Jar Fall Fillers it is becoming even more irresistible (and now I’m wondering what will be in store for other holiday fillers…) Beautiful projects. Thanks for sharing. You have wowed me over those cards all so so cute and for all agers!!!! Halloween fillers on the jars are so creative. I would love to win this set. The cards that you made are so cute. Thanks for the chance to win. Super super cute and luckily I just bought Friendship Jar this week! Will definitely be adding Fall fillers to my collection!! Wow… fantastic cards, full of Halloween/Fall creativity and inspiration! Super cute…love these fillable jars….so many possibilities….. I love the spiders and the eyeballs and the witch! It’s all fantastic! What a treat it would be to win this super cute set! I would have been clueless on what to creat with it, but your ideas and wonderful direction has me excited about this set! The fillers this month are so unique. What a great way to put a different spin on each holiday….having personalized holiday jars to give away! What a way to brighten someone’s day. Oh my! I resisted the original Friendship Jar set and die, but now that I see this wonderful add-on set, it may be hard to resist this month! Love your creativity!!! Nichole, you’re making me so excited for this set!! Love every single one of your projects and can’t wait to use those eyeballs and spiders on my creations!! Really can’t wait to see the full reveal. You and Mish have outdone yourselves again!! As soon as I’m done school shopping, I’m buying the entire set and all of the dies with this. It’s an amazing set! Can’t wait to get it. Your artwork is amazing. Mish and you make an amazing team! I just sit here amazed at your ideas. They are adorable. I’m not a Halloween person, but Fall and Winter are so exciting. I’m anxious to see the entire set and possibly you’ve changed my mind on Halloween. This entire set of goodies is “spooktacular!” All of the projects are over-the-top amazing! The spiders, the witch’s feet, the harvest fillers, the pupils to turn the original marbles into eyes (!) are absolutely fabulous, and I will definitely be needing those gorgeous papers to go with it all. Wow. Can’t wait!!! LOVE! Oh my gosh—this companion set is AMAZING! I love it! Your samples are so inspiring and SO, SO tempting—which is the point I suppose! I think it may have worked! I can’t wait, I can’t wait; my mind is spinning with “endless possiblities”! Holy Schmoley…Talk about a must have!!! This is so fantasic, it will be a best seller for sure! Love the fun, spooky and creative fillers for these jars! Fun, fun, fun! Love all these ideas! Just when I think you all can’t possibly come up w/any more great ideas – wham! – you hit us w/these cute, cute cards! Thank you! I have use the Friendship Jar already and it is so fun to work with. My great grandson asked me to get him a pet snake for his birthday. I put a snake image in the friendship jar and he was thrilled. There are so many possibilities and I was enchanted with today’s ideas. How Fun!! I love that witches’ feet stamp – I can’t wait to see all the fun things in this set. Dare I hope there’s a Christmas version too?? Yup, this sett will be mine! I love so many things about this set, but the last image with the broom and witch’s legs is just amazing! Love how you all put so much thought into each and every stamp in the jar set and all the fillers… So versatile! I loved the jar set when in came out, but haven’t had the extra money to buy it yet. Now i love it even more. With a daughter starting Kindergarten i know i will have lots of use for these sets over the years. I’ve been resisting this set because I didn’t think it was my style, but these projects have shown me it can fit into my world too. Thanks for the inspiration! The Friendship Jar set and Fillers are now a must have! I just love the samples for these! Absolutely love, love, love the paper and stamps! All these sets are competing for the #1 spot on my “Have to Have” list but the one inching to the top is the jar filler set–absolutely fabulous. How stinking cute is the Halloween jar fillers! I caught myself smiling and laughing out loud at the examples today. OMGoodness!!! These cards are amazing!!! My favorite is also the witch’s broom and shoes with all of those swirls and stars! I am another one if those ladies who thought I wouldn’t use the jar sets even though I thought they were wonderful. This just might send me over the edge! Wow! Love all the cards that you made. The Friendship Jar set has been on my wish list. I love the image with the witch’s shoes and broom. It’s genius! The eyeballs are fantastic, too. These jars and fillers are such great ideas. Another halloween winner! these sets are just too cute and whimsical. It is wonderful to see designs you don’t normally find. Way too difficult to pick a favorite with this month’s release. Go DT and loads of thanks for the inspiration! LOVE IT!!! so flippin creative!! keep up the good work- can’t wait to get this!! It is Friday the 13th and those glittery stars are calling to me. I hope the spirits are working with me here because that prize package is TO DIE FOR!!! You ladies have gone above and beyond this time (again…)!!! Oh wow! Well you know that you’ve designed a super stamp set when you can make it work for any occasion, any time of year! Fabby examples! The friendship jar series is fabulous. I love how it is morphing to fit the upcoming seasons! Great reveal and terrific ideas! Awesome, awesome, awesome!!!! What a perfect set to play with Copics! I love the sample with the pumpkin, acorn and leaf jar filler. It makes me excited for fall! Amazing! But I don’t have the Friendship jar set…oh oh…I know what this means! I can see this whole jar idea catching on with additional filler sets for all the holidays. Love the witches broom and shoes! 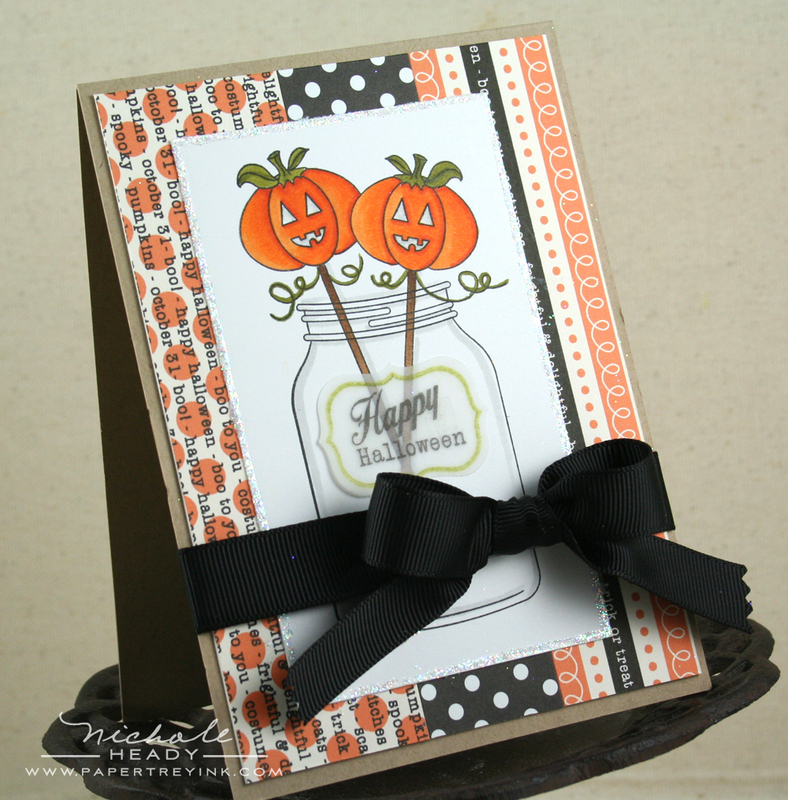 I’d also use some of the fillers without the jar for Halloween cards. I have LOVED the jar set from day one but haven’t been able to get it yet. I truly need this set and now with the fall images to go in it…! Oh my word, Nichole! I’m absolutely STUNNED by your cards today. Amazing. Love those creepy, crawly spiders! And the new paper is awesome! I haven’t bought the first jar set, even though I love it. It may have to go higher up on the priority list after seeing this set. I love anything in jars and this is no exception. My fav is the pumpkin picks. Great job Mish. Awesome samples! I love the witch legs! Can’t wait to see more! I have not purchased the Jar Fillers before but this may just push me over the edge and force me to buy it. I always love Mish’s designs. This set is so much fun! I have the friendship jar set and have used it many times, it’s so versatile. I hope you continue to add seasonal items for the jar – I can feel my wallet get thinner all the time. Oh my goodness; these are fabulous! I especially love that jar of eyeballs! Just too adorable- what a great set to add to my collection! Love the eyeballs and the witch’s feet in the jars!!! Oh, I just love my jars. What a fun addition. Hope there will be a Christmas one, too. You absolutely convinced me, with this latest set, that I want the original jar set – and all the related parts! Why am I such a sucker for cute Halloween? I really really am! I have to have this set, I love it Yes I already have the original set and the fillers so I will be adding this to my collection, great projects too! 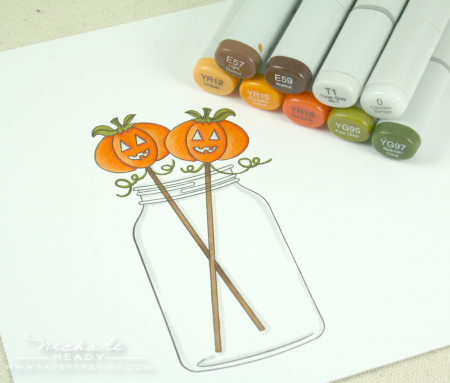 I love the idea of different seasonal fillers for the jars…especially since the images can be used on their own. Fantastic! YAY!! I love my friendship jar sets already and love that i will even be able to use it more now!!! I missed the original friendship jar set when it came out – I love it! The first card is so cute – and the dies are awesome. That jar would be perfect for bugs and things too, since my son is always carrying things like that around in a jar lol. This set is a definite must-have! What a great idea to make eyeballs from the gumballs!! How silly (and fun)! Love the new paper too. I resisted Friendship Jars in June, but this addition may just put the entire collection on my ever-growing wish list!! Oh, my goodness. Can it get any cuter than this. What a fun, whimsical, and surprisingly elegant set of images. I love it. So very excited about the jar fillers – they are just so fun, especially the witch feet! LOVE THE WITCH CARD! CAN’T WAIT TILL THE 15TH. I love all the various jar fillers – especially the eyeballs – those are awesome! Great job. Can’t wait for the 15th ! Oh I am so so soooo excited about this set! Can’t wait to get it myself!!!! I love that it is a BIG set for Halloween all on its own, could there be a Christmas set coming soon separately? I could just faint with anticipation!!! AWESOME job Mish and Nichole! the new filler images are so unique and festive..FUN!! What an imaginative and fun set! I’ve been holding out on purchasing the original set because I am not much of a colorer, but I think I will have to cave in this month. I can’t wait to see what you have in store for Christmas with this set! This set and your cards just make me giggle. How fun! I think the witches boots and broom are the best! Wow!!! Another Halloween fun set!! I love Halloween. Love the projects that were done today! The eyeballs were great and also love the apples Michelle did. WAHOO! Boy, do I love EVERYTHING in this set! I am sooooo excited; I just LOVE PTI! These cards are just amazing. I love all the different fillers for the jar. Can’t wait to see what you have in store for Christmas. Oh my goodness, just incredible!! I love it all!!! What amazing creativity!!! I LOVE these jars, especially the SPIDERS & eyeballs!! I didn’t get the original jar set but now I think I have to get it along with these fillers! Awesome design!!! My Goodness, how the creative minds at PTI continue to amaze us! I have been on the fence about the Jar set and dies, but these fall and Halloween images may just have sent me over the edge! I LOVE the little Jack-o-Lanterns, spiders and the Witch image in your last project. These are definitely the most creative Halloween images on the market today! Absolutely Spook-tacular! I love all your creations with the ‘Friendship Jar’ set and so exciting to see the Fall additions. My budget has not allowed me to splurge on this stamp and die ensemble but after seeing these great projects I am digging for loose change in all my pockets! Love the shoes and broom…hee.hee..hee! 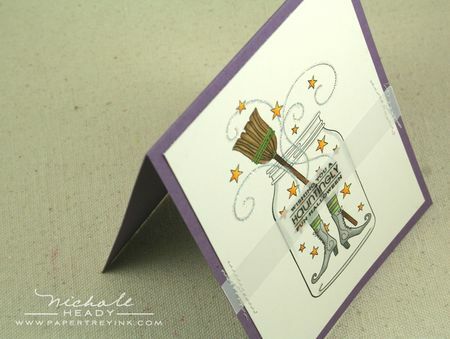 The Friendship Jar stamp set is on my list and with the Fall Fillers set . . . it has moved to the top of the list. My favorite image has to be the witchy shoes and broom. I thought I did not need this set, I am not so sure now…. Last month I told myself I didn’t “need” the friendship jars — now I don’t know if I can keep myself from buying both sets. I am a bit worried that my stamping budget will be blown this month! Oh my word! How much do I love these stamps…I am still saving to purchase the first round with all the bells and whitsles….and now this set is so stinkn’ adorable! Love your projects. Thanks for the continued inspriation. lots of great images and details for halloween. i really love this time of the year. OMG, this just keeps on getting better and better. I love it all – expecially these haloween printed papers – just gorgeous!! amazing inspiration, thanks! These new fillers for the Friendship Jar are amazing! I too love Halloween and love to make cards for the people at work. This set will definitely be a go to set for making those cards. Mish and Nichole you amaze me with your talent! Thank you for sharing it with all of us! I do not have the original jar set, but I think I will need one for sure. The friendship jar is on my want list but now it just moved up to the top!! Your samples and these cute images are just amazing! I am having a hard time picking my favorite project but I think turning the marbles into eyeballs was pure genius! I also love love the witches boots card – simple but just adorable – and SIMPLE!! I think I know what I am asking for my birthday next week!! Oh yeah, LOVE the beautiful autumn paper too!! Great designs and colors!!!! 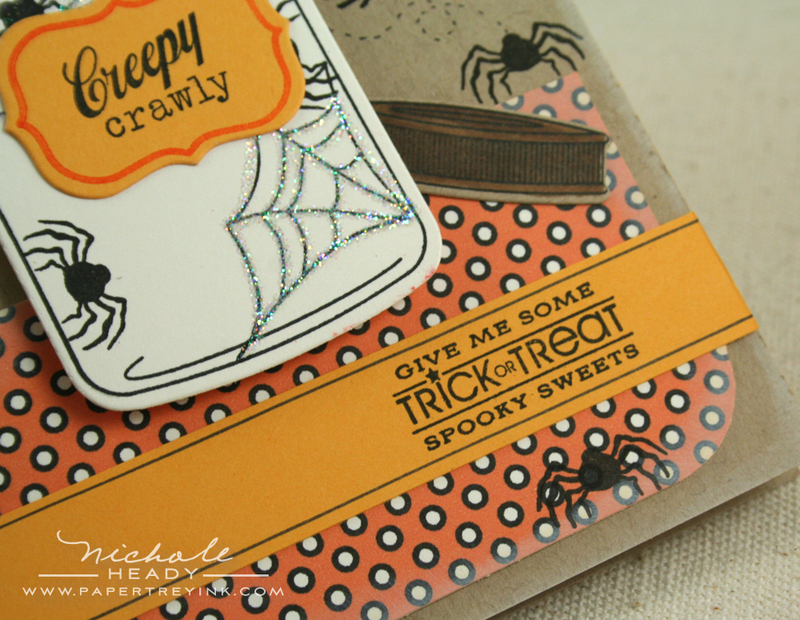 all of it is so incredibly cute – halloween is my favorite holiday stamping time so this will be a must have set. can’t wait to get started!! This jar series has really turned my head. You totally got me with the spiders in the jar! Loved Halloween and now love the endless possibilities of ideas with Friendship jars!!! In addition to how much I love seeing the new sets each month – I LOVE how much I learn by seeing these posts! So many ideas that transfer to so many projects! THANK YOU! You are so inspiring! I do not have the original Friendship jars set, but I would sure love to win this prize package so I can play with it! My favorite is the new stamp to turn the marbles into eyeballs – what a transformation! Love it! Wonderful cards. Wonderful set. Wonderful team. Thanks. OK – you girls have convinced me to get off the fence. The jars are going in my cart. Another great set! Love the witches broom and feet-so perfect for Halloween! OK… the eyeballs are just pure genious and I simply adore the witches feet & broom. Simply fantastic! Oh so cute and fun. Is it the 15th yet? What a great idea! I love it! Thanks for being such an inspiration! Holy cow! What fun. All I can say about this months release is “FUN”. You guys did a great job! Thanks. What a phenomenal addition to the Friendship Jar series. Love those eyeballs! Eeek! Fantastic and generous(as always) prize package! Oh, my, could this set be anymore fun! I love it. Your cards are sooooo cute, my fave is the one with the broom and witch’s shoes. Great set! I was on the fence about this set but, obviously, I didn’t see all of its potential! I love the pumkins, acorns, and leaves combination. I have now hopped on over to the other side! what an adorable set! soooo, so cute. love those jars. So creative. Love this release! Thanks for the chance to win. OMG, now I have to get that set (if I don’t win it … hint, hint, hint)! Those samples are great!!! Amazing! Love the Autumn details in this set! Spooky fun as well this is a wonderful addition to the friendship jar. so fun! love the spiders and eyeballs! The Friendship jar set has been on my wish list but you have just made it so much more tempting! I love these fall images. SO clever and creative! What really great projects. I too love the fall and halloween theme. What a cute set! I’m definately thinking about adding the Friendship Jar set to my collection. Your samples are just amazing! Hope there is a Christmas filler????? You and Michelle make a great team. These Halloween fillers are the trick and treat best. I would be ghostly excited to win this great give away!!!! 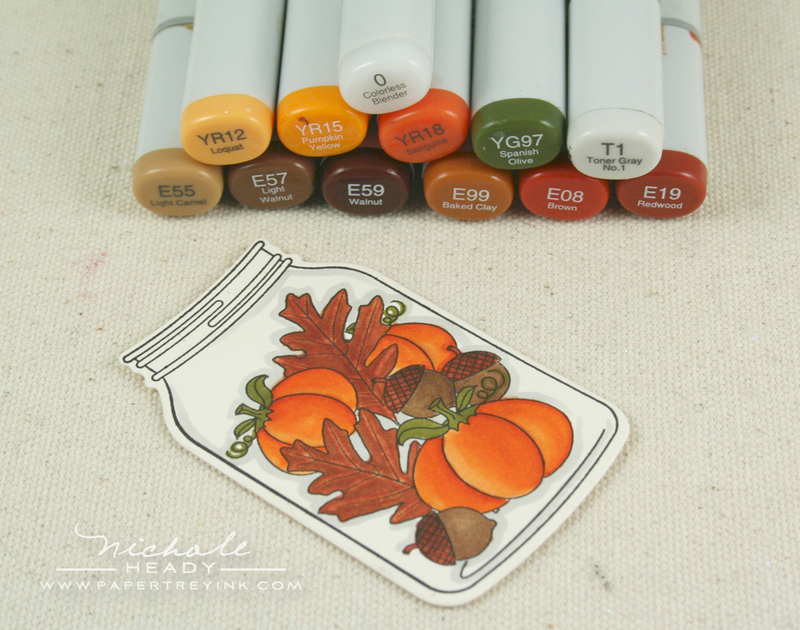 Wow, this whole jar concept is so versatile!I love the fall foliage filler in particular. I love this!! You and Mish have done an amazing job and it is wonderful!! wow…I love all of the projects in today’s post. What a great creative team Nichole and Michelle are! I have not purchased any of the Friendship Jar products yet, so I am really hoping to get lucky this time around!! Thanks for another chance to win! These cards are amazing! This set is definitely a must-have in the Friendship Jar collection! WOW Nichole, I’ve held off so far on getting the friendship jar sets but I don’t think I can hold off any longer. I am totally loving this set and all your fabulous cards. You simply amaze me. I can’t go wait to see what Michelle came up with using the set. How totally fun is this set???!!!! Love the ideas and the way you are building on the Friendship Jar set. The eyeballs are great, as are the bats and cobwebs. But then there is the witch boots with the broom and the Jack-o-lanterns – how will I know which one to start with? Very excited to get this set all inky! Well you have certainly outdone yourself with all these wonderful Halloween creations. I can’t wait to get my hands on these goodies. I love the jar of eyeballs – as creepy as it is supposed to be, it is really cute! my hands on this set. What a fun set. I love the eyeballs in the jar. Great job. How totally cute is this set??!! Love the way the Friendship Jar set is building into a “go-to” set for the different seasons. Love the little eyeballs, so creative! Love the spiders, the cobwebs and the witch’s boots – which image will I ink up first??? I am in big trouble again this month! You are going to make me totally into Halloween. I must have it all! I just love the witches legs with the swirly stars! I wasn’t able to pick up the first edition because it sold out so quickly. Hopefully I can get in on this set! I love Halloween too and this set will be perfect to give spooky gifts with! I am so impressed with the detailed images you and Michelle have created. The samples are outrageously fun — now I want to make each and every one of these cards!!! Oh my goodness, this is just the cutest post ever! I love the Halloween goodies, these are amazing!!!!!! I know this set as well as the original will be flying off the shelves! You and Michelle are a fabulous creative duo. I love that you are designing more things to fill the Friendship Jar! The possibilities seem endless…and those eyeballs are Genius! These cards are great! As a family of Halloween lovers — this set will be very useful! Great addition to a popular set! Thanks for continuing to add great additions for more uses from other sets. Love the ideas for cards! WOW! I really need this set. This is just so perfect for many of the fall/Halloween ideas that have been swirling through my head. The witch’s boots and broom filler is one of the cutest things I’ve seen EVER! I love it! Wow I can see this set quickly becoming one of my favorites and being used ALOT! I love this new addition to the original set. Fall is my favorite season, love the colors, the feel and the smells. These jars are SO cute!! What a wonderful addition. I do not have this set yet but it will now be on my wish list. I love halloween and I love the witches boots! Get out so cute! I love the Halloween jar stamp set. The images are super cute. I also love the new Halloween paper. This is an amazing addition to the original set! I love both Michelle and your blog’s. They are both a delight to read and you both are so very creative. I would love to own the Friendship Jar’s series, and dies. Hopefully soon I can work them into the budget. In the meantime, I am throughly enjoying seeing what everyone is doing with them. Thanks for the opportunity to win them! I LOVE Fall and Halloween too! Love the stamps, dies and papers and as always love the wonderfulm samples! Thanks for the inspiration! This jar set is unbelievable – esp with all the filler accents! The spider one is so fun!! So many wonderful possibilities! All of the cards are gorgeous! absolutely ADORABLE! LOVE this idea!!!! Oh my!!! I think you’ve sold me on the Friendship Jars with the Fall Fillers set! All of your projects are just delightful, Nichole!!! Can’t wait to see the set in its entirety!!!! Once again, I’m blown away! Very clever, I never would have thought of making eyeballs but that is so cute! Love the additions to the jars and am hoping for some Holiday additions to the jars next month. Nichole!! These Halloween cards are absolutely STUNNING!!! You simply amaze me each and every month with just how insanely talented you are! 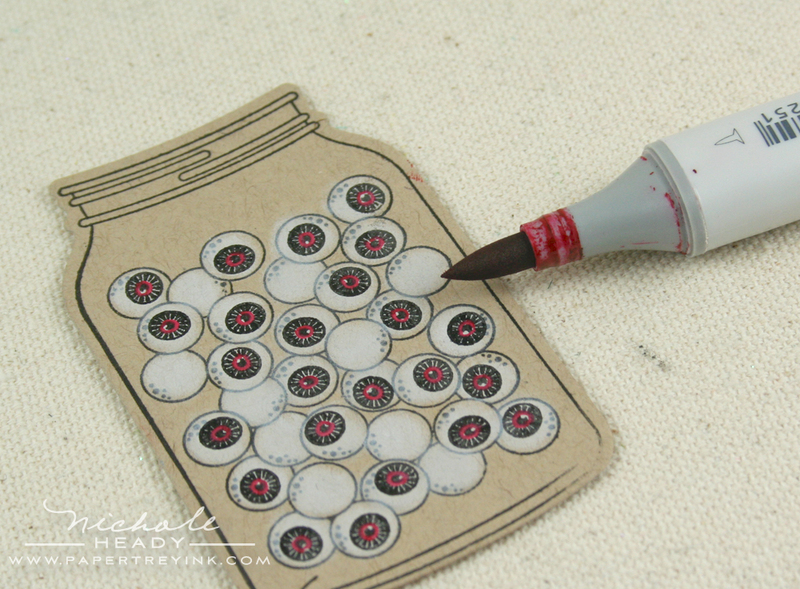 I especially love how you creatively used the marble stamp to make eyeballs…WOW!! Love, Love, LOVE!!!!!! Ummmm, yum – eyeballs! Your projects are just too cute and I just might have to add this to the wish list. Great job to the both of you! Love the witch choes filler! And those eyeballs … genius! Oh, I’m so excited about this set! I can’t wait to add it to my Friendship Jars set! What great samples. The new jar fillers look fabulous and so fun for Halloween. 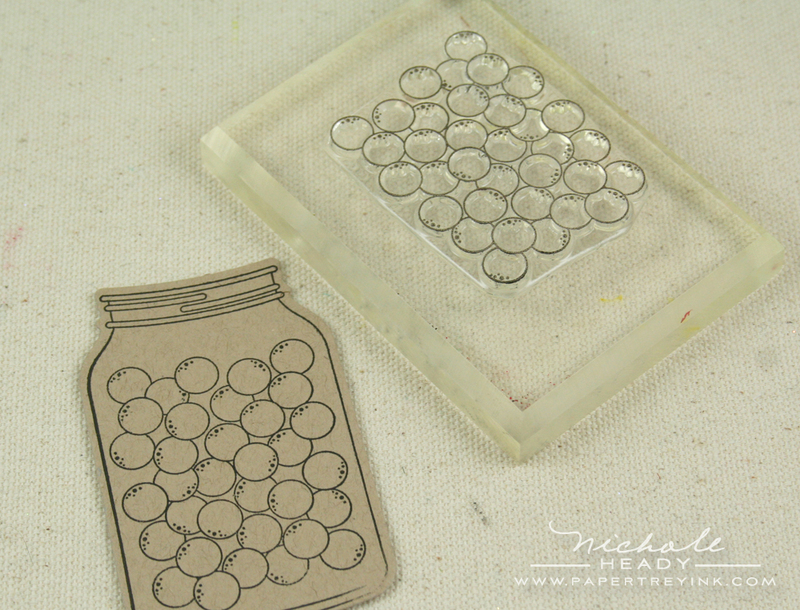 Can’t wait to start stamping some fun jars. Even though I have no small children anymore, this set is a must as my oldest is a Wizard of Oz fan and that broom and witches shoes image will be so perfect to make her grin. Can’t wait to see what other holidays join this amazing set in the future. Simply fabulous! This is fast becoming my new favourite stamp line. Jars full of happiness. So creative. How perfect and absolutely darling are these stamps! I must add them to my arsenal and now you’ve made me rethink my whole Halloween theme! Oh, I just love these jar fillers! 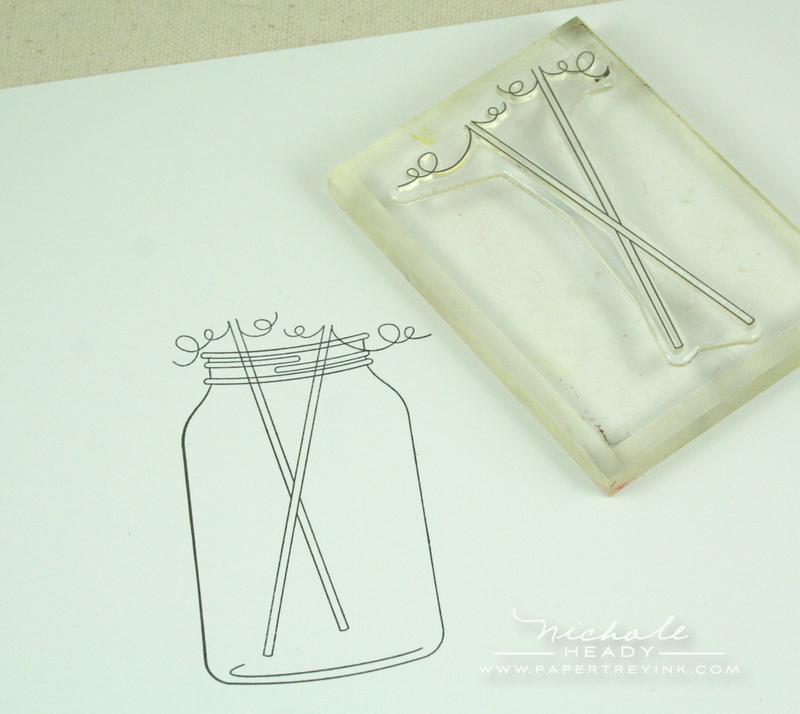 I love all kinds of jars – how fun to have them on paper too! NIchole, those are the cutest! I, too, love the witches shoes and broom- I bet you could balance that broom against a long sentiment, too- it doesn’t have to be in a jar!! Oh what a SWEET prize package Nichole! Money has been tight lately and I have not been able to add the original friendship jar sets to my PTI collection yet even though I really loved them (crossing my fingers I win this one). How creative and wonderful! Today was sure inspiring and a little spooky! These projects are spook-tacular and I can’t wait to get these stamps! Thanks! I hope this is the beginning of a trend; those jars can be filled with so many things throughout the year! These projects are wonderful; what a great release! These jars are precious! I love the eyeballs! I don’t have the Friendship Jar set, but after seeing all the cute projects today, it’s now on my wish list. I love all cards today, especially the one with all the spiders coming out of the jar. My boys would think that was cool, too. These are great! I love the pumpkins and acorns. Your projects are amazing. Wow, such a cute set! I must admit, the spiders to creep me out, I want them IN the jar, not escaping! But cute idea, nonetheless. So so cute! I love all of this fall/halloween stuff! I don’t buy it a lot because I only tend to use it once a year. So it would be awesome to WIN it! Thanks! What a fun set! Love the eyeballs and the spider cards! I had not planned on getting the original friendship jar set, but I may have to change my plans. This filler set is great! Could there possibly be Christmas fillers as well? I’m already thinking about holiday cards. Nichole, you are absolutely amazing. Michelle is awesome. Together, you are absolutely, amazingly awesome. What fun fall cards! Glittering the spider web is just genius. And those jars are all so cute. These would be so great to win! I have not got the friendship jars yet and would love to win them. Thanks for the chance. Wow, these are just so much fun! I’ve tried all this time to convince myself I don’t “need” the jars, but I think I do after these. Love what you have done with this set. Especially the way the candy sticks are separate from what you have put on top in addition to the way you could make a jack-o-latern out of a pumpkin. This set is very scary…in a good way!!! OMG! So stinkin cute! Now I definitely have to make the Friendship Jar set a part of my evergrowing Papertrey collection! Gorgeous cards Nichole as always! I was trying to avoid buying the jar sets but this may push them into my cart. Wow, this set is fantastic. And, as usual, what YOU have done with it—O.M.G. LOVE it!!! I absolutely love this set! Such a fun idea! Can’t wait to see the rest of the set in its entirety! Wow what a creative and original set! SOOOOOOOOOOOOOOOOOOOOOOOOOOOOOO cute! Love that jar die! Thanks so much for a chance to win!!! Nichole, you’ve done an amazing job of showing the fun we can all have with these sets!! Beautiful!! I don’t have any of these stamps or dies, but they would be such fun to use! WOW.. those are amazing projects! The details are fantastic as well as the new products. Oh my!! I LOVE the friendship jar! So many fun ways to use it! Your samples today are very creative! Love the versatility you have added to the jar set and can’t wait to see what you will add for the Xmas holidays. Now I know it be added to my must have list! I don’t have the Jar set yet. I was trying to resist. You and Michelle are making it very, very hard. I don’t know if I can hold out any longer. Especially after seeing that cute witch ensemble!! How adorable is that image? And how clever are ALL your projects?! FANTASTIC!! Love that new patterned paper! Love the witches boots!! That is worth the purchase price alone!! Wow, what a fantastic addition! Can’t wait to see what is coming down the pike for Christmas with this collection! Your “thankful for you” card is so lovely, Nichole… and it makes me think I might want the fillers just for that leaf and acorn image! WOW!!!! Just love everything about this set. The samples are just amazing! Love the patterned paper too! Has anyone been thinking Christmas, Valentine, Easter? OMG…the possibilities for these jars are endless!!! It’s hard to believe that Fall and Halloween are already here. I didn’t think it was possible to create an “elegant” Halloween set…but you did it! These are cute enough for kids and chic enough for adults (and what adult doesn’t like to Trick or Treat?) Wonderful addition to a terrific set! I just purchased the jar set at CHA and I can’t wait to get my hands on this set!!! I love the pumkins on a stick and the cute witches shoes!!!! Great set! What a great set! Love the eye balls in the jar. Such great ideas. I am extremely excited about this set! The paper is adorable as well. Love,love,love!!! Ya’ll have seriously got to take a break on all these gorgeous sets, I’m going to have sooo much explaining to do! Admission, don’t have Fillable Jars because even though I liked it, I didn’t know how I would use it so it wasn’t high on my Wish List…so changed now! Gotta have it, it’s now necessity! Is there a Christmas addition in the works too? (Hoping…) Love the new Halloween paper too, colors are gorgeous, everything is just perfect! Absolutely….LOVE IT! Can not wait to get this set to play! It is the best, most creative set ever! You have out done yourselves! So AMAZINGLY FUN!! You guys rock it…every time! I really really want this set after seeing what you’ve done…and those witches feet and broom, just my fav! Wow! This is such a fun set! It would be a blast to create cards with all of these images. You guys are awesome! Thanks for sharing and the chance to win! this set and your creations make my knees weak. It’s ALL so ADORABLE!! I just love Halloween. Can’t wait for it to arrive. We bought some decorations on clearance last year so we are excited to get them out. Thanks for the chance to win. What a fun set! 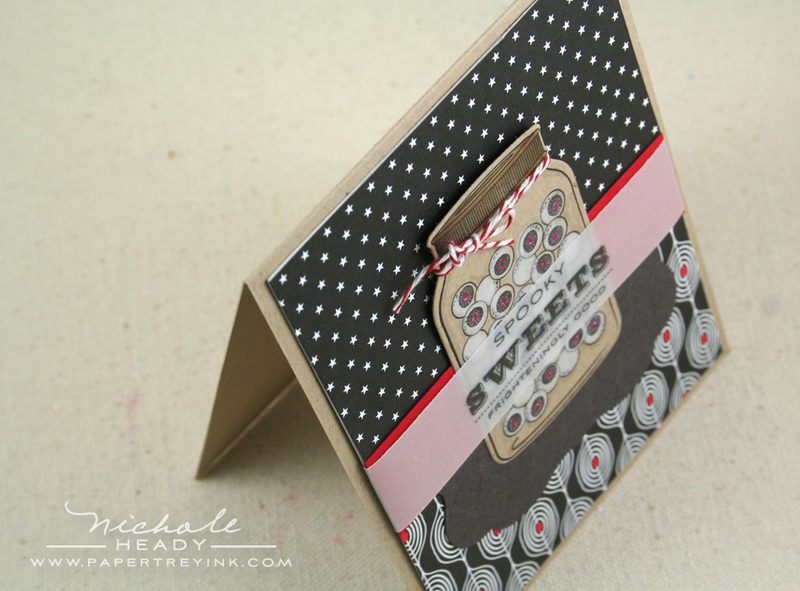 I love the eyeballs sample – what a creative idea! Oh, the jar fillers are just too cute for words! What a great addition to the original set! OMG! This set is soooo cute! I absolutely loved that last card. I already have the Friendship Jar set from before and will definitely be purchasing this Fall Filler. I love the eyeballs! I will definitely need to get the friendship jar now. Love this! Such great samples too!! The more I see these Friendship Jars and Fillers, the more I realize how much I really like the images. There are so many options with them. I can’t wait to see what’s in store for Christmas with these! Oh, I am falling in LOVE with ALL of your new Fall/Halloween sets – these are just adorable! The friendship jar is already a great addition…but the Halloween and fall can really make this even more unique a set. Totally love this and can’t wait to get this! oh my gosh, I am in LOVE with this set! I am amazed at all the different images, so much thought into making them work together. And the eyeballs? So cute! LOVE the eyeball idea! Another amazing set! I’m speechless! … You never fail to amaze me with your stamp sets and the creations you make with it … Fabulous job! … After the Fall and Halloween fillers I can’t wait for the Christmas one then Valentines then Easter … the possibilities are endless! I’ll be honest, I didn’t think I needed the friendship jar set until now. I should have known you and Mish would come up with stuff for the holidays!! And my boys would love the spider card too!!! Great job once again! These images are so great! I love the spider webs and the witches feet. Very different from anything I’ve ever seen. I love this set! I was waiting to buy the friendship jar set but this just put it at the top of my list… I love Halloween and the fillers are to die for! OMGosh, I want to re-create every one of your fun cards! These are fabulous!!! I love the new images but I do not have the original Friendship Jar and Fillers so that will be on my list, too, unless, of course, I’m lucky enough to win this fabulous prize:) Thanks to you and Michelle for your collaboration on these fun images! This is fabulous. That jar full of spiders made me laugh out loud. What a fun set this is. Can’t wait till the release. You and Michelle rock but I already knew that. The possiblities never end with the Friendship jar collection! Great job Nichole and Mich….never cease to amaze me with your creativity. I am one of those who love Hallowed eve…and wow…I always love Heather’s paper….the spider web…wooooo and what about that broom???? Outstanding you guys!!! The original Friendship Jar & dies have been on my wish list for a while. The images for Fall Fillers are spot on! I still can’t get over how the marbles easily transform into eyeballs. OK, I am officially addicted to the Friendship Jar and fillers. AHHH! Can’t wait to get my hands on these new jar filler images!!! So much fun! I don’t have the Friendship Jar set but I think you’ve convinced me I need it… and these adorable fillers! Amazing!! Love the new fillers, they’re just perfect for the upcoming season and holidays. Can’t wait to get started on my Fall-themed cards. The friendship jar was cute on its own, but with the addition of this amazing set, it just becomes so much more. Thanks for all the fabulous ideas. Can’t wait! This is super cute! I just love the image of the witches legs and her broomstick! How fun! I really also like the first card you did with the pumpkins in the jar. What a fun new set! The projects are so inspiring! I love fall and that includes Halloween so these projects and products make fall all the more fun! Okay, I wasn’t sold on the jar and fillers when it first came out. Once again Nicale has proven me wrong, I’m going to have to get them now! We don’t really celebrate Halloween where I live, but these gorgeous stamps are really fun. The Friendship jar sets are really something!! eeeek!! What a lot of fun that is!! Crossing my fingers!! So neat! One could have a hauntingly good time crafting!! One more reason to love Halloween! This is a great addition to an already great stamp set. Way to go! I’m not a big fan of coloring but I might just have to whip out the markers for this set. 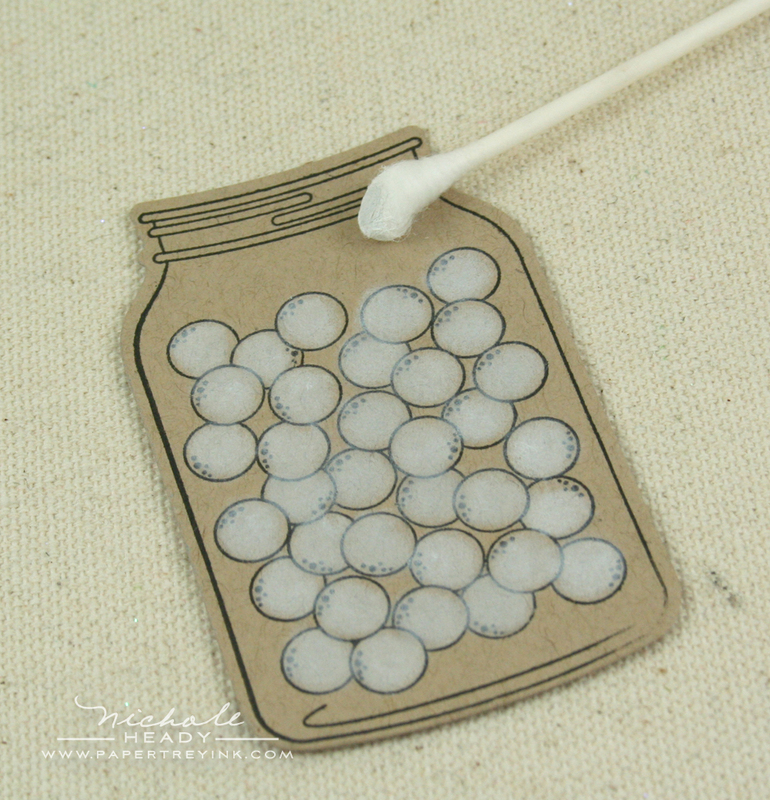 The eyeballs in a jar just crack me up – what a neat idea! Looking forward to the Christmas fillers – right????? Oh my goodness! what fun cards! esp love the eyeballs! When you introduced the first Friendship Jar Stamp set I debated on whether or not I would use it enough. After seeing all of your amazing samples using the new Friendship Jar Fall Fillers I know at least two sets I will be purchasing this month. Along with the cutest Halloween paper!!!!!! AMAZING projects!!! You are such a talented lady! I am seriously in love with this set. I bought Friendship Jars when it first came out. I recently purchased the first Friendship Filler and that is on its way to me right now, hopefully it will be there tonight when I get home. This is the first item I am putting in my basket on the 15th. Can’t wait to see what you guys have in store for us for Christmas with these! Hands down, this is my favourite set of the release!!! I am over-the-moon in love with the friendship jar set and am so excited that you have introduced a companion set geared to all of us Halloween fanatics! The patterned paper is AWESOME! Any hope for a Christmas-themed addition? So many cool cards! I LOVE the spider card! These make me want to have Halloween all year round!! Love it! I’m a huge fan on Fall and Halloween and I can’t wait to get my hands on this set! Autumn is my favorite season, and those Fall Jar Fillers are just calling my name! I love, love, love all of this! Such a totally cool set and fab projects…WOW! Super cute! You and Michelle have such creative ideas. Thank you for showing so many ways to use this neat new set! I really loved your samples. wowza! what a cool set! so many great images. love how you turned the blueberries from the first set into eyeballs!! wow! fabulous Halloween fillers! the eyeballs & witch images are great! I love the eyeballs card! My boys would love it if I made a card like that for them. I will definitely be ordering this set for sure! This is so AMAZING so funny it made me smile all the time …how could you and Michelle come up with such stamps. I sure hope you come up with even more jar fillers! I love the Friendship Jar set, but adding this filler set just takes it to the moon! I love the pumpkins and leaves and the eyeballs and the creepy spiders (ugh!)! The Friendship Jar and fillers stamps are the most unique and creative stamps on the market right now. Possibilities are endless! I’m positively GIDDY looking at your delightful creations Nichole!!! I LOVE all of the jar fillers you’ve created for this set and can’t wait to make some cards with them! I’m not normally a Halloween crafter but this set is really great. Thanks for showing off the versatility! Oh my goodness…now I’m ready to start making fun Halloween and fall cards. These are just too cute. What a wonderful set! This country girl loves jars and all the things you can do with them, and these stamp sets are RIGHT ON!!!!!! LOVE your and Mish’s projects! I just love the set. I just ordered my jars and can’t wait for them to come in. Will get this filler set for sure. I’ve held off on buying this set… and you guys have made it difficult yet again. Love all the images, but my fav’s gotta go the the eyeball card. Creepy, but totally lovin’ it! Would feature a humble canning jar? oh my goodness… this is crazy wonderful!!! Especially those eyeballs and spiderwebs! I am an absolute sucker for Halloween sets and this one has me hooked! Wow! I love this set. Thanks for making different sets that all go together. I love the Friendship Jar set and all of the fillers! What a useful and clever addition to your line of products! What an amazing set – I love it!!! Michelle Wooderson is amazing. What talent. Loving this series. The eyeballs in the jar crack me up! I’m in love! Oh what fun I would have with this set. I don’t have the Friendship Jar but it is definitely on my “wish list” now! Absolutely Amazing! Love it all!! this set is awesome!!! i just love the way your sets can be used in so many ways. fall is my favorite season. thanks. I didn’t get the friendship jar set originally, but this might have pushed me over the edge. And I love all that vellum! Your cards are always so amazing. OMW – I LOVE this set!!! The projects you made with this are ALL fantastic!!! This is a definite add to my PTI collection!!! The friendship jar already is amazing. This addition makes it even more wonderful. What fun Halloween will be this year. You both really hit it out of the ballpark on this one! Thanks! SPOOKY–the add ons are so great and getting me excited. I just want to start and create. Been in a slum but hope these new stamps will get me sooo motivated. The eyes are great, but all of them are wonderful. The Friendship Jar, filler sets and dies are just too darling – so versatile, I love that make my money stretch by using just a few supplies to create things for many occasions!! Well, these projects have done it! They are FAB! I can’t wait to see the full reveal! Thanks so much for the opportunity to win! Unbelievable that you & your team just continue to come up with outstanding ideas. My favorite card is the Thankful for You card. Gorgeous! Wow, what a prize. this is such a fun addition to the original set. It makes me very curious about future additions. 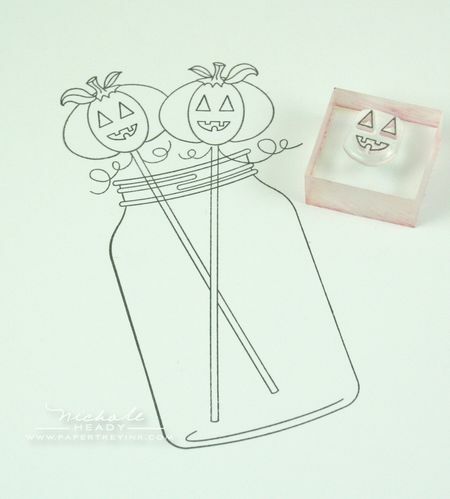 Teh jar set is now on my wish list and the Halloween Prints are a MUST have. Boo to you! I love how you can put anything & everything in the jars! Well – There goes the idea that I don’t need anything THIS month !!!!!! I cannot get enough of these jars and jar fillers! I love the crisp, clean design of each image….they are breathtaking!! I LOVE these jars! I can’t wait to see what else will be available in the future for all the different seasons! The possibilities are endless! Oh my god!! this is so cute!!! Love this set! Yes, I think I may have to add the jar and the additions to the August order….it’s birthday month for me, feel free to just add it to my shopping cart as a surprise present! 😉 LOVE, LOVE, LOVE, the boots in the jar with the swirls! Surely that would be perfect for an invitation to a Cinderella themed little (or big) girls birthday party…speaking of birthdays! Very, very cute! I don’t have the Friendship Jar set—–yet! But it is definitely going on my wish list. Thanks for the inspiration–your cards are very cute! I am in love with the Fall Friendship Jar fillers! The images are adorable. Only PTI (and Nichole) can make creepy spiders look soooo cute! Only problem is, I don’t have the Friendship Jar stamp set. Please let me win this prize package… Otherwise, my bank account is going to take a big hit. 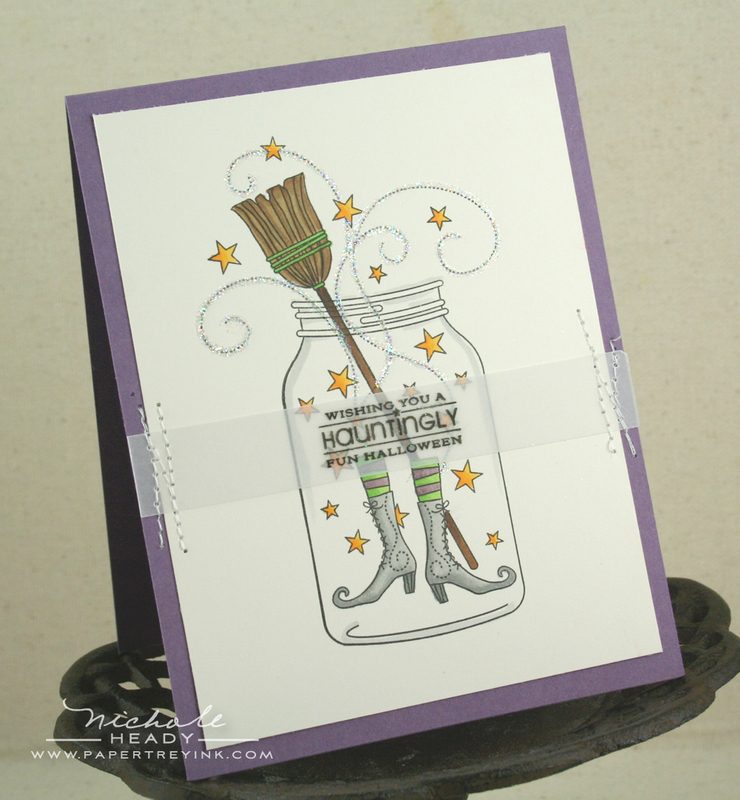 Your cards are incredible–this addition to the Friendship jars looks like so much fun! Love the fall fun in this set! So cute! Keep the fillers coming! OMG…You have made a convert out of me. I don’t usually buy halloween stamps, it’s just not my thing. But these are so cute I just have to have them. Mish is the best, so creative!!!! I love the eye ball card! I am an eye doctor and these would be amazing to send as Halloween cards. Great work! Who knew that Halloween could be put jar? 🙂 Such a clever little set that looks like lots of fun to create with! Thanks for all your inspiration! I love everything about the jar set! Absolutely adorable!!!! amazing! i am drooling here! i was so taken with the original jar and filler sets, but this new fall set takes it to a whole other level!!! How do I feel about this? I WANT IT!!! What wonderful ideas you have planted. love the PP! Great images! I Want It All!!! I don’t usually send Halloween Cards, but these samples could make me change my mind! You have outdone yourself yet again! This is a must have so I hope you’ve stocked the shelves full. 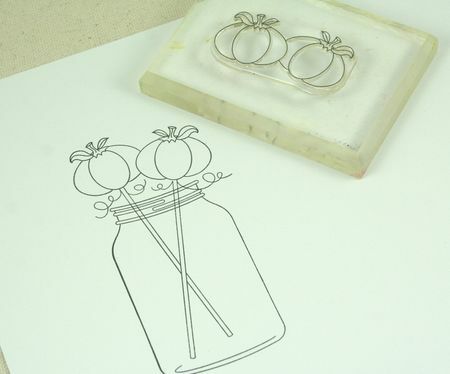 The images are fabulous and coordinate so well with the original jar sets. Oh these are just too fun! I love the pretty fall images of pumpkins, acorns, etc., all lovingly gathered into a jar — BUT I also must say that I laughed out loud at the jar of eyeballs! Hilarious! And I agree with your boys that the glistening webs are fabulous. I would LOVE to play with all these gorgeous stamps!! Friendship Jar keeps getting better and better, if that’s possible, because the first one is such a show stopper. I can only imagine all the fantastic goodies you will come up with to fill it at Christmas and Valentine’s Day, summer at the beach, etc. The witchy card is divine! Honestly, can it get any better than that? Golly, PTI just blows my socks off…..
WOW! This is an awesome set. I could do so much with it. My kids would love the eyeballs! I am sure they would be a big hit in school this year. Thanks! Awesome!! Love the Fall Fillers for the jars. Can’t wait to see more in this jar series. I’m sure PTI has more to come. Always so creative!! Such talent!! That did it for me. I just placed an order for the Friendship Jar stamp sets and dies. I thought I could resist it, but Halloween is my favorite holiday and this release has put me over the edge. Ok, so Halloween is one of my most favorite times of year. I absolutely love it and to have all this Halloween goodness to go with it makes it even more awesome! LOVE that there are so many accents to use with what we already have and love. Can’t wait to start creating!! Every month you gals AMAZE me with all your creativity, that’s why I LOVE PTI! Fun stuff! This set is just getting better and better. I held off buying it the first run through but its getting tough. These are are totally amazing! Love the various things you can put on the sticks. SO much fun! I have been so in love with the jar concept and love the idea to add elements for fall and halloween. Can’t waiat to play with these new sets. Love these new sets. I don’t have the original jars set, but now I am rethinking it. I love the samples shown today! And I am thinking this may be a recurring jar theme??? Love, love, love all the projects – simply amazing!! This is a fabulous addition to an already spectacular set! I adore these!! I honestly wasn’t all that interested in the jar set until I saw these!!! AWESOME!!!!!!! Oh My Gosh!!! I think this is my favorite yet!!!!! I love these cards–and think I have to have these stamps. another awesome set. I see some great Halloween games I can make for school with this set!!! A must need for my collection, that’s for sure. Wow. You blew me away with your samples! I LOVE the eyeballs one! That is just pure genius! All of the fillers are so fun and creative! Can’t wait to see more! Now I have to get the jar sets! These are so cute!! I have the friendship jar set and am really looking forward to the fall fillers to add even more versatility. These cards are so cute! I really love the friendship jar and all the different ways it can be used. Every month I’m blown away by the creativity of the PTI team! Creepy Crawly and Sppoky Sweet make me giggle with excitement! I love this set and the samples. Excellent job on this set Michelle! Oh, the jar fillers are just to adorable for words! Love the samples and all the inspiration to create. I’m going to have to get the Halloween prints too! Thanks for all the fun! OHHHHHH…Friendship Jar just gets better and better. I see Christmas fillers, Valentine fillers, maybe Easter fillers, oh and flags and stars for the Fourth….So in love with the jar concept! I knew this set was going to be wonderful. I can’t wait to get it. I’m looking forward to the holiday addition to this! Love the new patterned paper. Looks like soooo much fun! Would love to have it ALL!!! 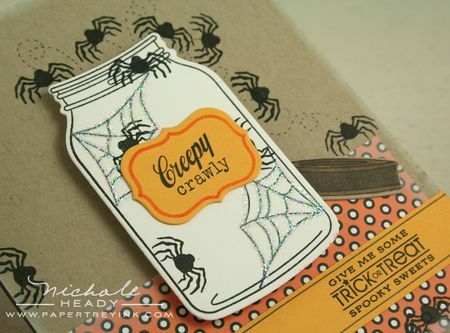 I LOVE the creepy crawly card! How cool is that! The eyeballs are another wonderful example of the versatility of the PTI stamps! LOVE IT! So fun and imaginative! I can’t wait for Christmas ones, too!! I love this set! The images are so cute. Every month I am in awe of you and your team’s creativity. Thank you for the awesome eye candy! Love the set! The Halloween and fall images are fantastic. I am with the other commenters, can’t wait to see what Christmas will bring. You guys are amazing! Once again you amaze me with your creativity. What a great set! I’m loving this set! You guys are making me more and more excited for Halloween by the day! Thanks for your inspiration! Absolutely wonderful creativity!! Both on the designers part and in these projects. So modern & fresh… love this idea so very much. I absolutely love this set. Hope to see a Christmas – winter set… hint,hint. Each sample was my favorite till I saw the next one. I can’t choose just one! I can’t wait to add these new stamps to my Friendship Jar collection. They’ll get lots of ink-time as I wait impatiently to see the winter/Christmas additions. Your cards are too cute! Soooo much fun! It always amazes me how each release keeps topping the last…. I just love, love your stamps and all the coordinating products. What a blessing you are to so many crafters. Keep up the good work. The spider card is absolutely creepy! I love all of your card designs, they really sell this set. Now I have to get that Jar and all the fillers… Unless I WIN! Another great creative option! I can’t wait to get this set! Too CUTE!! I love these!! The papers are gorgeous and the stamps are fantastic! I love the spiders and eyeballs!! Perfect! Wow, so amazing–love these new images! The spiders would be SO much fun but my favorite is the witches broom & shoes!! I love Halloween, I love this set, and I love Papertrey Ink! Oooh…I so hope you come out with jar fillers for ALL seasons!!!! You all are just such geniuses….such fabulous concepts. You sure know how to make a girl swooooooooon! As an ophthalmologist, that eyeball card is adorable!!!! I would love to put that image around my office. You folks are quite clever. Yes I am one of the many that could NOT resist the first Friendship Jar set and now another one to make me drool! Your cards are amazing as always and this set is definitely on my list….eyeballs and all! Oh I can’t wait to get this set! What you have done here Nicole is beyond awesome….it’s brilliant! Love your designs! How cute. I just love those fillers for the jar set. I love how the new set coordinates with the jar set previously released. Love the colors and ideas to use the new holiday themed jar filler set! Thank you for all of the new items!!! I don’t normally make Halloween cards, but that will change this year! That witch image is honestly the cutest thing I have ever seen. I love, love, love this set! OMG OMG OMG I have been waiting to purchase the friendship jar sets and dies, but now this has pushed me over with joy and excitment!!! Fall is my favorite season and Halloween is my favorite holiday. My husband carved a pumpkin saying “Will you marry me?” when he proposed on Halloween! !”sigh” AH fond memories!! Love love love the eye balls!!!! Those are great!!! The paper is just to die for as well! What a great addition to an amazing stamp set. I love the spider card how wonderfully creepy! Can’t wait to see all the new possibilities with the new additions. Oh My — This post is the best so far! Okay, I want it all!!!! This jar set is amazing. I really don’t know how could it get much better. Your projects are so elegantly spooky and fun. Genius! The friendship jars are beautiful in their own little “country” way. Reminds me of all the canning I used to do. Oh my gosh! These are just too cute! And I love the patterned paper! Awesome! Okay, you have convinced me…now I NEED the Friendship Jar stamp set and everything that goes with it! Great Fall and Halloween cards…such wonderful card ideas. My head is spinning! My favorite…all of them! Yay!!! I have got to get my hands on this! I love the Friendship Jars set. Ya’ll can keep on creating more to go with it! I am always impressed with the new PTI releases, but this has to be one of my favourites of all time!! I adore Halloween and the fall. I love the changing of the leaves and the crispness in the air. This set that Michelle conceived of is going to be well loved in my home! As always your cards blew me away. I think these filler images would be great even used without the actual jar stamp. I don’t have the original jar stamps yet, but with so many different ways to use these images they are definitely on my list now. I wonder if a winter/Christmas filler set will be coming up soon. That would be AWESOME! Wow! I don’t own the Friendship Jar set, but now I have to have it. I love the pumpkins and the witch’s shoes fillers. So cute! I can’t wait to see the fillers for Christmas and winter!! How fun . I would love to win! What a fun set the jars Halloween set is! I do not own the original/first jar stamp set, but after today’s showcase I might have to buy it! LOVE all the cards you made today Nicole! What an inspiration you are! Wow! So cute! This set looks like so much fun! Once again you have created a versatile stamp set and amazed us with your creative samples. These are so much fun to look at! It’s all about the shoes for me!!! I love the witchy card. 🙂 Can’t wait to give this set a whirl. I have died and gone to Halloween heaven! I am absolutely stunned with your gorgeous cards and that fabby new filler set!!! This set is so awesome, I fell head over broomstick for this set!! Wow, wow, wow, wow, WOW!!!! Everything in this set is so magical – it looks like it’s going to come right off the page. Just phenomenal stamp designs AND cards. This is such a fun and extremely cool new additions set – so different for halloween!! Love it! Your samples are awesome & I LOVE this set!!! Another great addition to the Friendship Jar set! I love this set…..don’t own the original Friendship Jar stamp set …..but I sure am adding both to my wish list! WOW! What an amazing set of stamps. I really love all the versatility you get with these sets. Thank you so much! These are too cute and so unique. I better go buy a lottery ticket to win…I want it all. I love it! I don’t have the original friendship jar set..now I’ll have to get it! So, so, so, so cute! Hah, the spider creepy crawly card is just awesome! 🙂 The fun eyeball center is just awesome as well! Hope we’ll be seeing more fun fillers for these jars! This just adds to their versatility! AWESOME!! Goodness, the creativity, the inspirations are simply amazing!! I love these new jar fillers – so fun! And I love the idea of the vellum label. I am going to have to try that now! WOW … Michelle Wooderson is such a talent … I just LOVE her … I want to BE her!!! Great, fun additions to her Friendship Jar Set…Well Done! I am completely blown away by your projects with this set! Wonderful addition to Friendship Jar. This is one amazing prize package! These are so fun and creative. I love Mishes style. Great addition to an already great set! Love them!! What a great concept! You guys amaze me. You and Mish have created another hit. Friendship Jar is on my wish list, which is very long, but will be moving up after seeing this filler set. I love that the filler set can be used on its own the way you designed it. Great job, ladies. I love LOVE the friendship Jars set. Every single image is adorable! It is deff. on my wish list!! What a wonderful set. I LOVE the friendship jar concept and it’s versatility. I would so enjoy adding this to my stash. :)Your cards are just amazing! I love the eyeball jar – so fabulous. I want it! Love the jar fillers set. What fun. What great ideas! I love all the cute Halloween jar fillers! wow oh wow!! I’m jumping up and down in my chair!!! These sets are AWESOME! So many ideas are spinning around in my head. I = SUPER ♥ these!! Here’s crossing my fingers that the Random Number Generator is kind to me and fills my craft room with all the goodness that is overflowing from your Friendship Jar sets! WOW, how totally creative you & Mish truly are — amazing!!! This is an absolutely wonderful set!! What genius!! OMG…I can’t wait until release day! 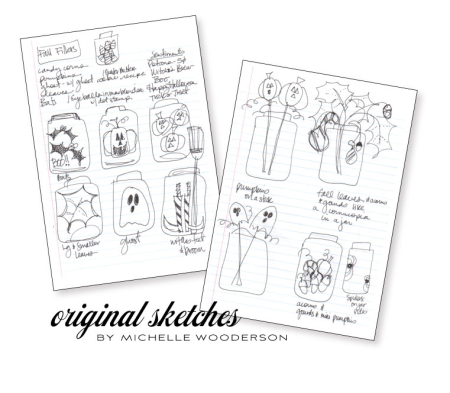 I just love all of the ideas and the mini step-by-step design tutorial. I hope this is a sign of more good things to come…this is so exciting! This is awesome!!! There is never anything that you guys forget, isnt there? 🙂 I can’t believe all the stuff that runs thru your head and we all get toplay with all that talent!!!!! Ack! Too cute! Too cute! This is fabulous!!! I think the spiders are my favorite! How fun are these jar fillers!!! Great job with your examples! I LOVE the new halloween paper too!!! MUST HAVE!!! I loved the jar set when it first came out, but this is pushing me over the edge! I hope that you’ll continue to provide fillers for other seasons, too – maybe more flowers??? I adore your ideas! OMG! I can’t wait to get my hands on these stamps! Wow, these cards are AMAZING! Have you ever thought about bundling up your samples for a giveaway during release week?!?!? What a TREAT that would be!! I’m loving these jars! Could they be any cuter? Wow… would love to play with these! Well…now I want the Friendship Jars!!! I got such a kick with the jar full of eyeballs. And the witch in the jar. Gosh…Nicole…PTI rocks!!! I say it every month…how does PTI do it? Month after month I am just amazed!!! Wow! These sneak pics and project ideas are just…so…calendar marking worthy!!! There is nothing else to say but to say that Papertrey Ink rocks! Gotta LOVE these additions. Have the original jar, so MUST HAVE THE ADDITIONS! I don’t even know where to start….it is all so cool! I love the glitter on the spider web…so fun! I love the fall portions too! 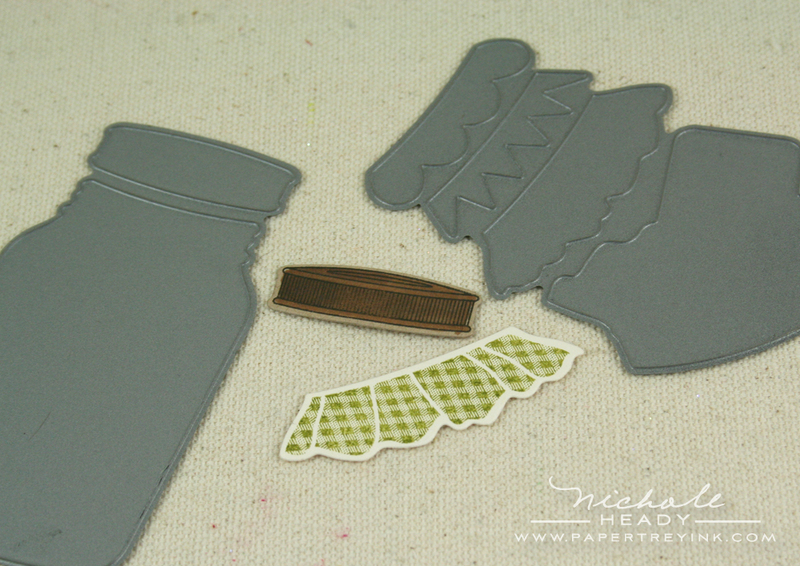 (and another peek at embellishments set looks great too) Love the patterned paper too! Either I win this random drawing or I buy this on the 15th, this addition to the Friendship Jars is going to be mine. LOVE THIS set. You all did a GREAT job! I just LOVE the friendship jar series and will be adding this to my set. So many wonderful things to do with this and I can’t wait to see more sets in the future. TOO MUCH FUN!!!!!!!!! I love all your stamps they are of the best quality, I would love to win this Jar set!! Seeing your creations show amazing creative versatility!! Wow, these new fillers are awesome. Love the spider web and eye ball projects. My kids are going to love this set too! I adore the witchy shoes image and am loving the new take on vellum! Great inspiration as usual!! How cute is the eye ball card? I love it. I am seeing so many possibilities with this set! Those eyeballs are to die for…too cute!!! Once again, great cards! Oh my! What fun cards! 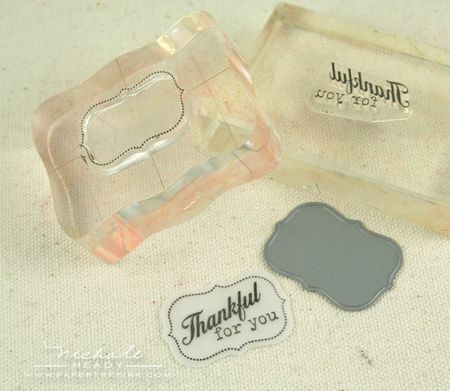 I do not own the jar stamp sets but they have been on my wish list – I think they just got moved to must have list! What an awesome looking ‘additions’ set! This will be a must have set for me. LOVE all your projects…they are wonderfully executed! The “marble” eyeballs are awesome! That would be a great card to pair with my Ohio Buckeye eyeballs we make every year around Halloween. Great job and ideas. Amazing!!!! I have to have those fillers!!! OH MY GOODNESS!!! I LOVE IT! Such a fantastic idea…you gals are just so creative. I can’t wait to see more…hmmm, might there be a Christmas fillers in sight? And your projects are simply adorable, can’t wait to get this set. Aaaaaaaaaahhhh!! I LOVE this set!! Michelle is a genius, I must say!! Thanks for the chance to win such a fabulous prize package!! Oh my! I am not a stamper but this set might just convert me! I loved everyone of the cards! Hope I win! I didn’t purchase the original Jar set because it didn’t seem like anything I might use… until NOW! I also prefer Fall & Winter over Spring & Summer, so this addition is right up my alley!! Would love this prize to jump right in! Oh no! I thought that I had avoided buying this set even though I really wanted it…now I’m positive that I absolutely NEED it! Shoot! Love the cards…I’m sold. Absolutely fabulous cards, Nichole!! The entire Friendship Jar set has always been on my wish list but I think Fall Fillers has just bumped it up to the top of my list! Oh this is just wicked cute…..love it!! Thanks for continuing to make your products so versitile and giving us soooo many great ideas! YAY!!! Love it! Thanks for giving us a chance to win it! What a fun set! I am so excited about all these uses for the Friendship Jar set. The ideas for the Halloween fillers are amazing and I especially love those darling boots! I’ve LOVED the Friendship Jar concept from the beginning, so I love that you’re adding more to it. Even though I’m not a huge fan of Halloween, these cards sure are cute! And I look forward to seeing what the set has for Thanksgiving/Harvest as well. Just what I need, pick me, pick me. Great set and the samples a must to copy. These jars are the cutest images on the market!!! And to have all the fun stuff to put in them and on them makes it all so much fun. I can not hardly wait… would LOVE to win,thanks for the oppurtunity! I don’t have the original FT set yet, but I must admit that the jar with the spiders escaping has me rethinking this state of affairs! What cute H’ween & Thanksgiving fillers! Wow–lots of ideas to this set–thanks for making a fall version. Loving the new halloween jar filler set! I think it is a definate on my purchase list this month! Such cute card samples too! So fun! How exciting that you are introducing seasonal fillers 🙂 Now can’t wait to see what you have in store for Christmas! GREAT cards – don’t have the Friendship Jar set but it’s been on my Wish List!! Love this set..esp the pumpkins!!! So stinkin’ cute! What a great set for fall theme projects! Super darling. The sentiments from 2009 tags sure work perfectly with the jars too. Oh my goodness this is just too fun! It is a must-have in my book! Ohhhh how I love this. I think this may be PTI’s best series of stamps yet. The images are gorgeous, the lines are gorgeous, the dies are gorgeous, it has SO much versatility. What’s not to love?? I would be soo overjoyed to win this prize package!!! I broke down and ordered the jars in a second order last month. And I’m so glad I did! These additions are fabulous and I’m considering making some things for our church bazaar. “Canned goods” are a huge seller! Oh. My. Goodness. I didn’t think I needed the Friendship Jar set. Until now. Holy cow- I am totally LOVING these fabulous Halloween fillers! They are so cute, and fun…and go so perfectly in those cute jars!! Eeeeek! You are going to break my bank account this month!! wow, this set is the definition of FUN! Love the additional possibilities with these jars. Can’t wait to see what else you guys come up with. Perhaps ornaments and pinecones and candy canes? I love the jars! But as we dont celebrate Halloween I am hoping there will be other sets to co ordinate with the jars. I LOVE the new fall addition to the original jar stamp set. It looks just amazing! I must admit, it was something I could live without when it first came out, but I would love to have it now! I just love all the fall jar fillers! Your samples are wonderful! Such a fun set, and cute samples! I’m not really a Halloween person, but I laughed out loud at the spider jar- what a great idea!! Great projects, Nichole! I love this filler set. I do not have the original set as yet, but I definitely will be adding it to my wish list. Love these! I am going to the get the original jars for my mom for Christmas. As these additions keep coming, I get covered for gifts for Mom for more upcoming holidays! Thanks! My fav is the witch’s feet and all the swirly stars! You always do such a great job in enticing us!! I love the shoes and broom image. Thanks for the chance to win. ok, i hadn’t bought this set, but it has become a must have…i love everything fall. I must say that this was a set I was on the fence about…wasn’t sure how much use it would get…so I’ve put off buying it. Love the new fillers…this may need to be added to my collection! LOVE this!! What a perfect Halloween treat! Oh what a fun set! I bought the entire Jar set with dies last time, and this would be a fun addition. My favorite is the pumpkins and leaves and acorns – so perfect!! I laughed with delight as I viewed each Halloween card this morning- soooo clever and cute!! I can’t wait to get my hands on the fall jar filler set. Amazing!! Those cards are soooo great! I’m going to add this to my wish list and I’m going to need more stamping time!! Wow! These are fantastic cards. I love the last one best of all, but those eyeballs are pretty great too. And yummy paper!!! That is the greatest halloween paper I have ever seen! So CUTE! 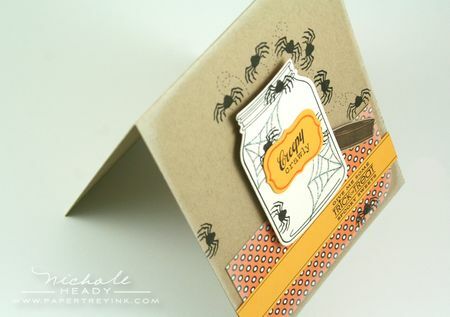 I love the spider card – perfect for Halloween. I haven’t purchased this set yet, but now it’s a MUST have for me. TFS. I don’t own the jar set, but now that I’ve seen all these samples, I want it! The autumn card is my favorite, and the spider one creeped me out so much I skimmed faster through the other ones! I’m a cutesy Halloween girl, not a scary one! Thanks for sharing all these ideas! This set is the best Halloween set I have seen in a long time, I really love the Witches broom. Just adorable. I haven’t purchased the Friendship Jar stamps yet, and I wasn’t sure I wanted to, but those eyeballs and the witches legs are sending me over the top! Love them ! Love all the things you used to fill the jars! Just too fun! I have been tempted by the *jars* before, but since fall/halloween is my FAV season/holiday, this could be what pushes me over the edge to put them in my cart! I’m giddy with excitement! OMG – I wish we would celebrate Halloween here in Germany – nevertheless – this set will go into my shopping cart – LOVE IT!!!!! WOW, this is just over the TOP!! I dont have the friendship jar original set yet, but I think I have to put it all on my wish list now!! Such cool, inspirational projects. Thank you!!! Oh Wow! So much fun! I absolute love this set and can’t wait to get my hands on it. Nichole, what great ideas you came up with! Love it!! I’m very excited about the friendship jar fillers – can’t wait to create some awesome creations! The fall and Halloween jar fillers are adorable and way fun too! I LOVE the spiders and eyeballs and can see using those on many gift projects and treats for my kid’s classmates. My daughter even likes the spiders and eyeballs! The witches shoes are fun too. It’s looks like this set will offer many fun images and sentiments! Your creativity never ceases to amaze me! Love the glittery spider webs, the jar full of eyeballs, and witchiepoo jar. Your attention to the details makes each of your projects so special. Fun stuff!!! Wow! I don’t own the Friendship Jar set yet, but this is an amazing addition. I loved how you turned the gumballs to eyeballs…genius! These are super cute!! Love how you turned the marbles into eyeballs. I LOVE this set! I just love Halloween cards. You girls are amazingly creative, having more jar add ons. Devilishly cute cards. Oh…you guys are terrible! I have been trying to convince myself that I don’t need the friendship jar set (which has been quite hard I might add…look at it all the time when I’m on the site) and now you’ve hit me where it hurts…you tied in Halloween! 🙂 We LOVE Halloween and I just don’t know that I am going to be able to resist the set now 😉 I love all your projects with it and can invision how fun that set would be this Halloween. Thank you again for all the awesome creations you put out every month! I love this set. You guys at PTI never cease to amaze me! Fab halloween stamps, luv them really, luv the spiders in a jar, so fun and spooky! what a treat! I just got this set this week. What wonderful additions–I too just love fall. Loving this whole concept. Oh gosh…I think I have to get the jar stamp now. These are too cute. I love this – truly, madly and deeply. To be honest, I haven’t been too sure about the whole jar filler concept up until now but I am utterly sold and will be buying myself some ASAP. Great ideas and marvelous samples. I love the eyeballs!!! What a fantastic idea! Now I guess I have to actually get the first 2 Friendship Jar sets to go with this one. This is really turning out to be a great release month! Oh my gosh! You are killing me with all of the fun new stuff. These cards are over the top, super duper! Love what you did with the eyeballs & spiders. Got to have it all. You and Michelle are so creative. Thanks! Love it all! I am so excited to start working on making Halloween goodies! These images are amazing & so mush fun! Love the spider jar 😉 Thanks! I love all of these cards. I really wish i had bought the jars. Now I guess I am really going to have to buy the jars because if it is this good for halloween i can not imagine how much fun the Christmas stuffers will be. These fillers are adorable! 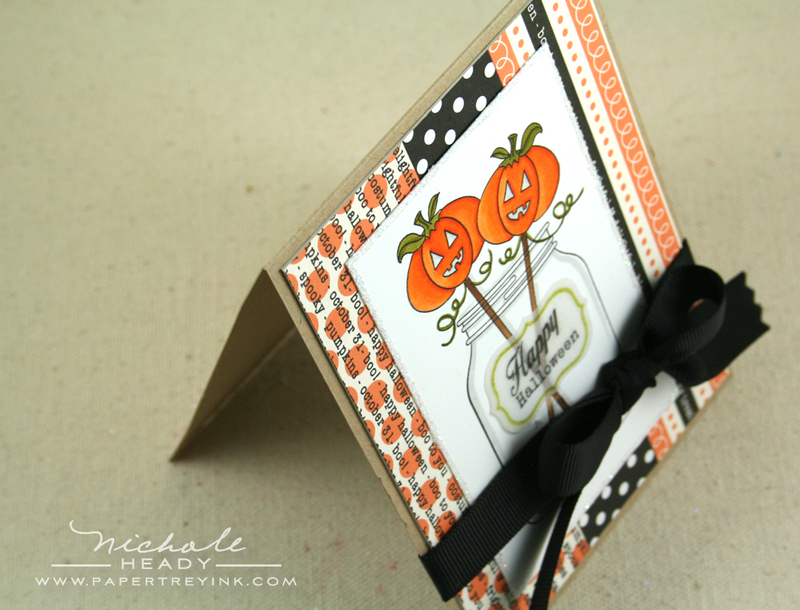 Love, love that Halloween patterned paper. You ladies rock! I love all of the jar fillers and especially the broom and witch legs. The patterned paper is also awesome and I can see myself making lots of fun halloween cards and treat wrappers with it :). Oh my! The additions are awesome! Love the gumball eyes!! I love making Halloween cards and I really like the jars and fillers. The Halloween paper is great too. Thanks for the chance to win. I think this preview has just pushed me over the edge. I didn’t think I would use the original friendship jar set but after seeing these additions and everything you’ve done, I want it all!! Your creativity is so inspiring. Oh my gosh…the eyeballs…they are so…dare I say…eye-catching? Hilarious! Thanks for making me smile today! OMGosh!! So adorable. I hate spiders in real life but I think I love the ones in this set! How fun!! WOW! Those spiders crawling out of the jar are TOO cute!! I don’t even have this set……yet. Now I HAVE to have it with all the trimmings! Wonderful, beautiful samples!! Well, this is just adorable! I don’t have the jar set yet, but I may have to have it. I ust love what you did today. I’ve never been a huge fan of Fall/Halloween stuff until I’ve seen these sets! AMAZING! Oh how I love fall! The versatility of these new sets open up endless creative possibilities. WOW! WOW! WOW! I adore this! I didn’t think the jar sets could get any better, but this is FANTASTIC!!! Amazing! I don’t know what I love most—the printed paper, the eyeballs, the spiders escaping the jar or the witches feet! I would love to have this set. AWESOME!!! the shoes and broom are the BEST!!! I love that witch is so funny. I love it. So interesting projects, like usually. Oh my GOODNESS!!! This is so stinkin’ cute and I want it right now (said in my whiny-cause-I want-it-this-very-minute-like-a-seven-year-old-kid voice). Great work! Usually stamps grow on me… I have my favorite line(s)… but this one I am drawn to immediately! What an amazing concept to add even more purpose to the Friendship Jar collection! You two are smarties! 🙂 And I love the spider and eyeball cards most of all…creepy and elegant are my two favorite combination for Halloween. Thanks for the chance to win. What a fun set! Very spooky!!! You are way too clever, Nichole! And those eyeballs…. ugghh, but brilliant! What an awesome set!! SOOO many possibilities! Love the ideas! I have wanted the jar set for a while now and now I want it even more! Your sample cards are amazing and are so inspiring. Thank you! What cute cards! Love the jar idea! What a great addition these fillers will be to the Friendship Jar! You have given me so many new ideas – can’t wait to see what fillers you have in store for Christmas! WOW, these are absolutely AMAZING!!! So many great additions for the jars, and I can’t believe some fo these ideas – fantastic! i just totally love this. i have never really made too many hallowe’en cards before but this year i am going to send one to everyone i know. Oh what FUN! You better have plenty of these in stock! They are going to fly off the shelf w/or w/out the broom!! Gorgeous set and fantastic inspiration. Too, too cute! I love all of the fallish possibilities with this set! I love the Friendship Jar series. I haven’t gotten any of the stamps yet, but have certainly had them on the top of my list. I love the fall fillers — especially the broom and witch’s boots. Super fun set! I love all the coloring possibilities! Thanks for sharing! Wow! What incredible additions to the Friendship jar set. Thankfully, I own the original set, love it (!) and will definitely be getting this filler set. Those samples are great! Love the eyeballs! Can’t wait for the 15th. I just loved the idea of the Friendship Jar when it was first unveiled and now, with the halloween motif it is just absolutely adorable. I can think of so many adorable items I would be able to put together for my grandchildren. You all do such a wonderful job with your designs. Such a fun set – spiders & eyeballs & witches britches- who wouldn’t love a jar of that! Wow…what a set! Great ideas. I would absolutely, absolutely, absolutely LOVE to win this prize! The original Friendship Jar sets had been on my wish list, but it’s just not in the budget to buy it now:( I just LOVE mason jars and this entire set is soooooooo well designed! And the fall fillers – soooo sweet! I’m hoping to perhaps see some Christmas fillers in a couple of months too!!!! Very cute additions. Can’t wait to see more! These ideas are so great! I definitely will be adding this to my list for purchase on the 15th!! Thanks for the chance to win! I’ve fallen in love with all these images ~ especially the eyes in the jar. So smart! I have and LOVE the jar set:) I didn’t get the fillers last time, but I HAVE to have these! I may have to go back and get the fillers from last time soon!! So very COOL! The jars are still on my wish list. I have a few real ones, so I enjoy seeing how you decorate them with everything. I keep buttons in mine, but my mother canned in them for 50 years. A 100 qts. each of all kinds of fruits and vegetables. Yikes, those eyeballs are scary! I love the look of the flourishes in the background on the kraft jar, too. Wow, what a fantastic giveaway! I adore Halloween and love what you’ve done with this set. 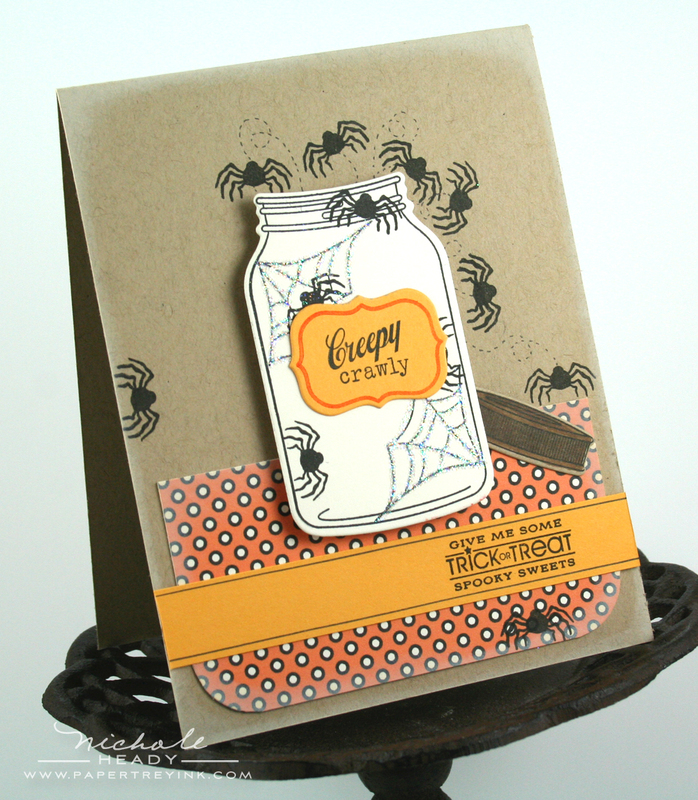 The second card with the spiders crawling out of the jar is adorably creepy! I just love all of the detail that is put into these cards! I love the spider webs with the added glitter–what a great idea! My favorite is the witch boots with the broom 🙂 Too cute! The Halloween set is AWESOME! I love the patterned papers too. Wonderful Halloween samples. I’m usually not a halloween person, but this set is just too awesome to pass up. Love it and thanks for all of your inspiration,. This jar series just keeps getting better! I love it! Mish sure does have good ideas, and you make them shine! Oh my I just love the image on the Witchy card, all the stars and swirls and her boots and socks are simply adorable! I didn’t think I “needed” the Friendship Jar set until I saw the new fillers. It is definitely another must have! I want, I want, I want…to win soooo bad!! I have the original Friendship Jar set and Die cuts, and now I can’t wait to add this Fall/Halloween set. Not to mention that your card ideas are just wow!!!! How spooky… love all the additions. i’ve been waiting to see this set, i knew there would be more fillers!! these cards are so fun, great for getting the fall season on the mind. awesome set!! Love, love, love this set!!! So many cute projects with this set… must have of this release! I didn’t get friendship jar when it first came out, but this new set is having me add it to my wish list! the comment number I have is a good one for Halloween and a bad one for any other time. I love the jars. I use my jar tons. I have copied the looks of some of my moms “salsa” and made fridge magnets out of them. They look hilarious to those of us who get it. Just darling and with those samples who can resist? Of course I want it all. I’d like to take a bite right out of those caramel apples. Those whitch feet are awesome. I love the eyeball idea. This set is too cute! I really didn’t think I “needed” any additional Halloween stamps, but I’ve changed my mind! I LOVE these new Friendship Jar Fillers. It’s so much fun to have another set that expands upon one that is already such a favorite. This is going into my cart tomorrow night, for sure! ewwww the spiders & eyeballs are so creepy but cool! Love all the new jar ideas! Fall is my favorite season! This set is so much fun! So many possibilities…my mind is spinning! Clever use of the marble stamp…love it! I love these cards and can’t wait to get started on my halloween goodies!! Your creativity is inspiring!! Who know the friendship jar set was so versatile… amazing!! Gorgeous projects! I don’t yet own any of the Friendship Jar items (was kind of on the fence about them), but these fall projects will probably push me off of that fence. Thanks so much for the chance to win all these goodies! wow I just know I just might have to hit the I want it all button. Yes…this may make me have to have friendship jar! Love these! Oh my! These projects are fabulous! I cannot wait for fall and halloween to get here so I can make these cards! Haha, we don’t celebrate Halloween much in Australia, this would be a great way to start introducing a new tradition. Very, very cute set and I can see little boy cards as well. Wow! Your creativity never ceases. I would love this set! The friendship jars set wasn’t at the top of my list of wants It was somewhere in the middle. I love this addition to the set. I can’t get enough fall and Halloween stuff. I think my favorite are the witches shoes to to cute. You guys are so creative. I love love love the Friendship jar! I bought the Friendship Jar, then had to have the fillers! Now I have to have these!!! I love it!!! WOW! These samples are AMAZING! I’d been able to hold off buying the Jar set for now but this addition has SOLD it to me it’s gonna be on my next order! Halloween in my part of the UK is gonna be HUGE! It’s something us Brits don’t celebrate but I’m going against the trend with this one! Here’s hoping to a HOLIDAY addition to the set……????!!!!! Wow – I have two boys that would love the spider card too! And the witches boots & broomstick – my favourite too! You & Mish are such a clever combination! I absolutely love the Friendship Jar set and it’s already on my wish list! Oh my WORD!!!! WOWZERS! I have the original friendship jars set and CANNOT WAIT to get my hands on this new fillers set!!!! LOVE IT!!! And that Halloween paper couldn’t be cuter!!! WOW!!! What a fabulous set. I love the eyeballs. Pick me please. Oh my goodness! Such cute cards – your talent / creativity never cease to amaze me! Each month keeps getting better and better. So glad I found your site! I love all things fall and these are simply adorable with a capital “A”. I love the cards you created using the new set… Truly inspiring! I love your cards! you did such an amazing job with this set. At first I wasn’t sure about the jar set but now I am definitely considering it! What an amazing giveaway!!!!!! Love the cards and all the amazing halloween fillers. I can’t wait to see what you have for one more night of cards! I can imagine all the jarfull of fun you could have with this set. Love all the samples. You gals are so talented. Add this to my cart! These are just fantastic. I had no idea that you could create so much using a jar! Who knew, apparently not me. Once again, I am blown away by the creativity of everyone. What a great way to maximize use out of the friendship jar stamps! Very clever! This set is perfect and I love your samples! Makes me wish Halloween was here!!! oh I LOVE these images so much! the eyeballs and the witches feet. so fabulous! You and your team are amazing. I cannot believe the creativity with the jars. I can’t wait to purchase this stamp set for my Halloween cards. Thanks for all the great ideas. I love all the great ideas. You’ve inspired me to make Halloween cards this year! I love this. Love the cards and the endless possibilities! I’m in love with these creative ideas! 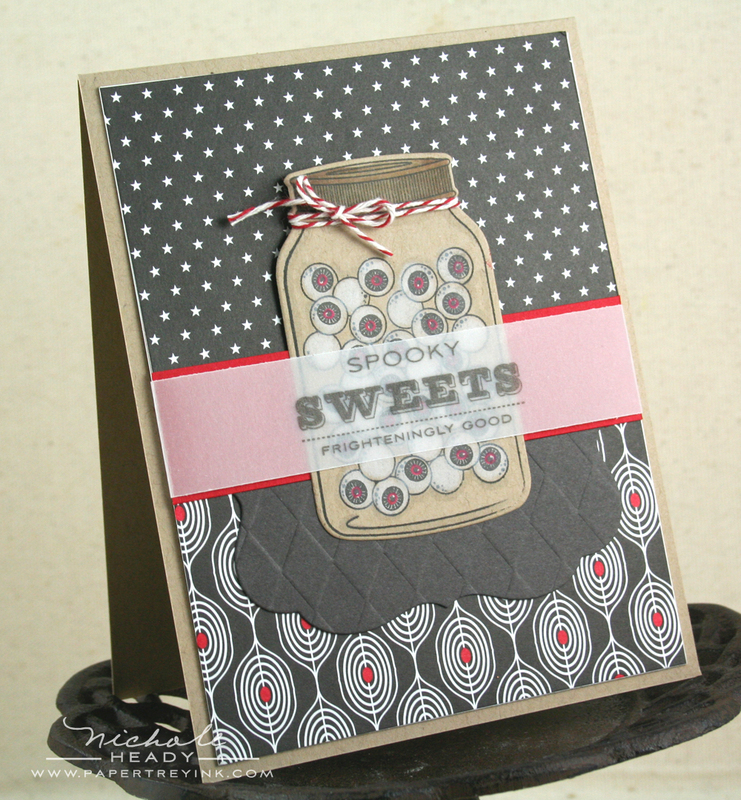 I LOVE LOVE LOVE this whole series of stamp sets and coordinating dies! I never thought I would be the one to say “I must have a jar stamp!” But goodness me, looking at all of the amazing samples today and from the previously released Friendship Jar series – I have this on my “Need” list! So cute! What a great addition to the Friendship Jar set! Love it! Fall is one of my favorite times of year also. So happy there is a mixture of both in this addition set. Oh me…oh my…I must have it all! I don’t have the Friendship Jar set yet, but now I definitely have to put it on my wish list! I have a feeling my pocket book is going to be squealing this month! Fall is my favorite season of the year and I LOVE all things HALLOWEEN!! The Friendship Jar Fall Fillers are to die for!